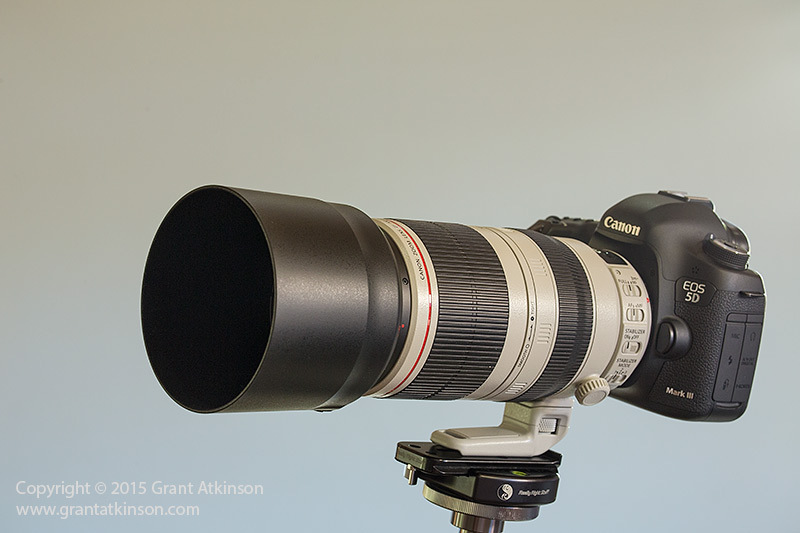 The Canon EF 100-400L f4.5-5.6 L IS ii is a lens that was a long time coming. It’s predecessor, the original push-pull EF 100-400L f4.5-5.6 IS, was on the market for more than 14 years, and it was certainly a successful seller. In my line of work, leading photographic safaris, I have probably seen more nature photographers traveling with that lens, than any other. Although the original lens combined a strong set of features, the steady improvements in Canon lenses over the years meant that the original 100-400L was being outperformed by a number of other Canon L-series lenses including most recently the EF 70-300L IS. 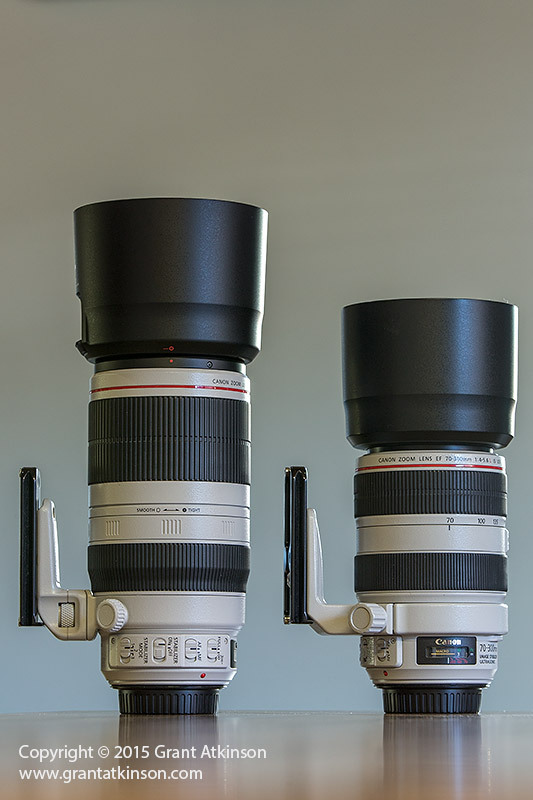 Canon completely redesigned the new 100-400L f4.5-5.6 IS ii, even though the main specifications of focal length and maximum aperture appear similar. Released worldwide in December 2014, the new EF 100-400L f4.5-5.6 IS ii is well equipped to be an able successor to the lens it replaces. At the time of writing this review, I have already been using my copy of the new lens heavily for more than six months and am confident that I have a good idea of what this lens can do. The EF 100-400L IS ii is really all-new. 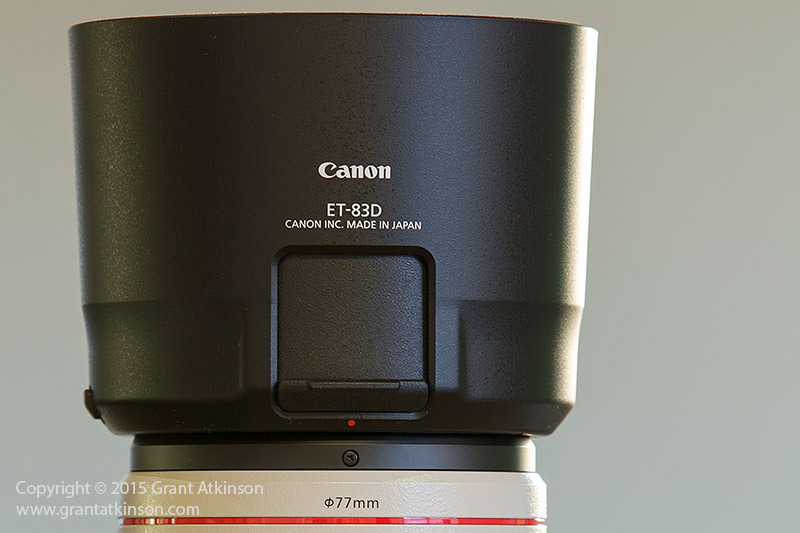 It is no longer a sliding, push/pull zoom, (or linear extension) as Canon call it. 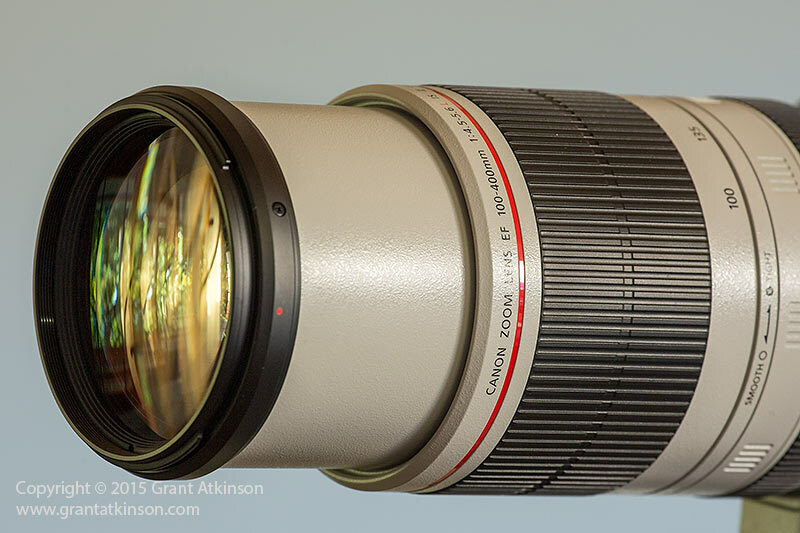 Instead it features a more conventional rotary zoom design, which is similar to the excellent Canon EF 70-300L IS. Both the inner and outer sections of the new EF 100-400L IS ii are made of metal, like the old lens. The new Zoom Touch Adjustment ring makes it quick and easy to set zoom friction. The lens mount is standard Canon EOS, now with a rubber weather-sealing ring to keep moisture away from the mount. The base of the lens is smooth, without any of the (grip-assisting) ridging found on some other Canon L-series lenses. There is a single elongated switch panel that wraps around the lens barrel. This new panel houses switches controlling focus distance, AF/MF, the four-stop stabilizer and three IS modes. The switches are recessed and require firm pressure to move them. It is now more difficult to accidentally bump a switch and reset it. This is something that happened to me often with the older lens. There is a focus distance indicator on top of the lens. The new tripod collar is more like those found on Canon’s super tele lenses, in that it is fixed in place. This collar is not removable, although the tripod foot can be easily detached via a threaded collar. No tools are required to remove the foot. Obviously this new tripod collar comes as part of the lens, which is good news, and does not have to be bought separately. The stepped focus ring is positioned just ahead of the new tripod collar, and forms part of a step up in the diameter of the lens barrel. Another new feature for Canon on a rotary zoom is a tensioning ring, located ahead of the focus ring. Canon call this collar the Zoom Touch Adjustment ring. The new zoom ring is wide and comfortable and easy to operate, with tension infinitely adjustable using the ring. The ring is wider even than the zoom ring found on the Canon EF 70-200L f.28 IS ii. The EF 100-400L 4.5-5.6 IS ii has the zoom ring in the same place as as its smaller stablemate, the EF70-300L IS. The focal lengths are marked on the zoom ring itself making it easy to see exactly what focal length the lens is set at. The EF 100-400L f4.5-5.6 IS ii changes size during zooming, with the inner barrel projecting to its maximum length when the lens is set to 400mm. At full extension, the lens becomes quite long. 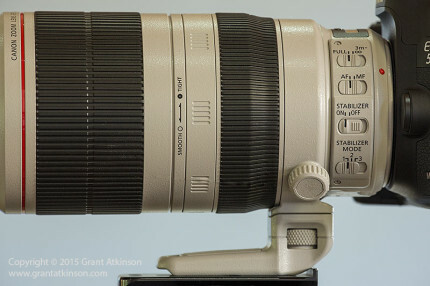 Fully retracted, the EF 100-400L f4.5-5.6 IS ii is fairly compact in form. At the end of the lens barrel there is a raised black collar that serves as a mount for the lens hood, smoothly attached by 3 flush-mount screws. This collar forms a neat, flush fitting when the lens barrel is fully retracted. This fitting looks like it will make it harder for dirt to get inside. The lens hood was problematic on the original EF 100-400L for me. With prolonged use, the mount threads would wear out and the hood would become rattly, loose and sometimes even fall off accidentally. 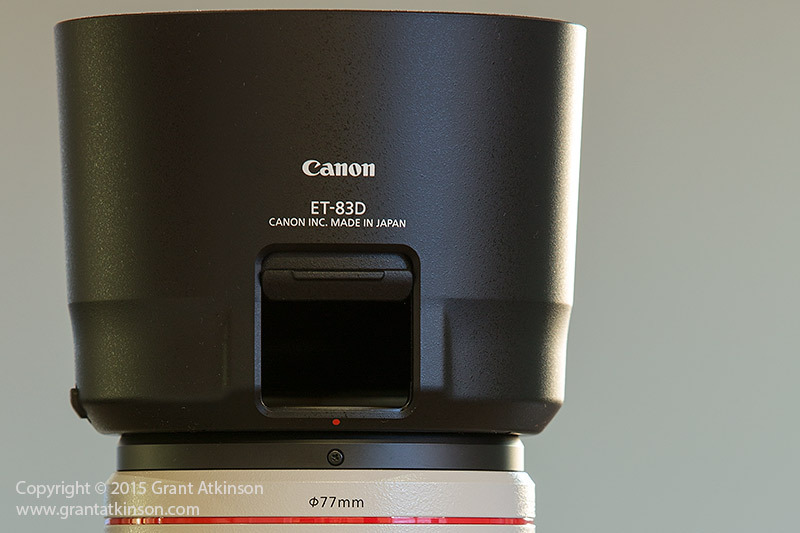 The design of the brand-new ET-83D lens hood, shows that Canon have taken steps to address those problems. The new hood has a sprung, locking tab to improve on it’s fit. It clicks into place when properly attached. This lens hood is most similar in design to the ET83-II found on the EF 70-200L f2.8 IS ii, perhaps just a little thinner. The lens hood is covered inside with a dark flocking material, to prevent stray light rays from causing unwanted reflections inside the lens itself. New to this lens hood is a window that can be slid open, allowing access to a rotating filter element such as that found in a circular polarizing filter. Clicking the access window open allows access to the filter, if there is one fitted. The lens front element is protected by a pinch-type end cap, which is easy to attach or detach, even when the hood is mounted for use. The front element has a 77mm diameter, which is a common size amongst a host of Canon lenses. On the inside, the EF 100-400L f4.5-5.6 L IS ii is all new optical design too. There are 21 elements contained in 16 groups, making it a more complex design than the lens it replaces. One Flourite and a single Super UD lens element are incorporated in the make-up of the optics. Flourite and Super UD elements are highly effective at combating chromatic aberrations and improve overall image quality. Canon also claim that flare and ghosting is further enhanced by the use of their latest Super Spectra and Air Sphere Coating technologies. Modern lens coatings have played a role in helping optimize image quality for digital sensor cameras, in ways that were not imagined when older lenses were designed for non-digital cameras. The front and rear elements of the lens are also coated with flourine, which makes them super slippery, meaning they stay clean for longer, and clean up easier. The lens comes with a zippered, padded nylon bag that can be used to store the lens alone, with its hood reversed. Handling this lens is an enjoyable experience, and it imparts an impression of high-quality. The new switch panel, with it’s recessed sliders, is easy enough to get to with my left hand, and the switches are stiff enough that they no longer get bumped accidentally onto wrong settings. That used to happen to me a lot with the old lens. The zoom ring has a smooth, controlled feel to it, with just enough resistance, even with the tension ring backed right off. The inner barrel, even fully extended, exhibits no play at all. This is still true for my own lens which already has six months of hard use on it. I am comfortable with the location and function of the zoom ring, located as it is ahead of the focus ring. 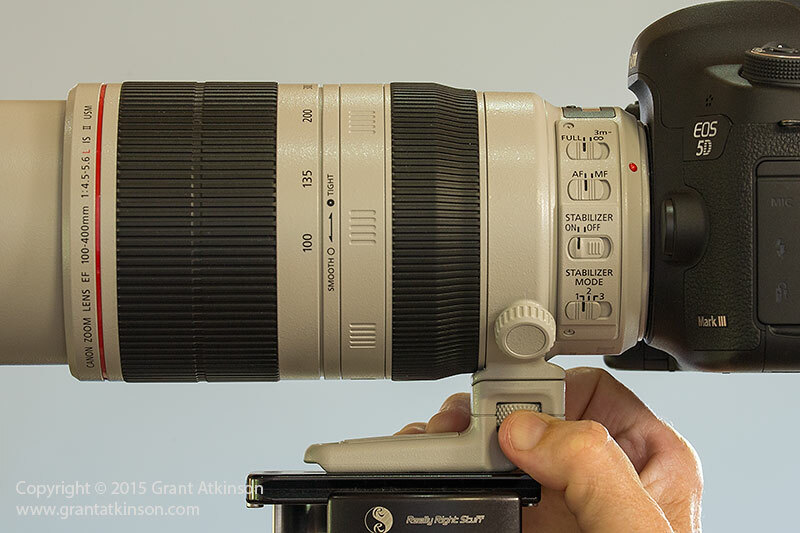 I usually mount a Really Right Stuff (or equivalent) lens plate on all my telephoto lenses. It makes the lens foot longer and easier to grip when carrying the lens this way, and it also makes a good place for me to hold onto and support the lens when handholding. I rest the bottom of the tripod foot/lens plate on the palm of my left hand. I then control the zoom ring using my left thumb and two fingers. If you handhold a lens like this with the tripod foot removed, be sure that your grip is not inadvertantly shifting the zoom ring or focus ring whilst shooting. If I am using a bean bag or similar for support, I rest the tripod foot/lens plate on the bean bag and not the lens barrel. That prevents the focus or zoom rings being accidentally shifted by contact with the bean bag. The section of the lens barrel where the main controls are located, has quite a large diameter. It’s a little bigger than either the old 100-400L or any of the EF70-200L f2.8 lenses. Photographers with small hands may find they need to adapt how they grip and control the zoom ring because of this. To go from 100mm to 400mm, requires a twist of around 100 degrees which I can achieve with two twists. In other words I need to let go and re-grip. I shoot my EF 100-400L f4.5-5.6 IS ii with the zoom tension ring backed right off, making the zoom function as light as possible. This allows me to make those zoom pulls using only my left thumb, with a little help from my index finger. Being able to adjust focal length as quickly and easily as possible is a big plus for me and the way I shoot. I am finding that the handling of the new EF 100-400 is making it easy for me to come away with several different compositions from one shooting scenario. 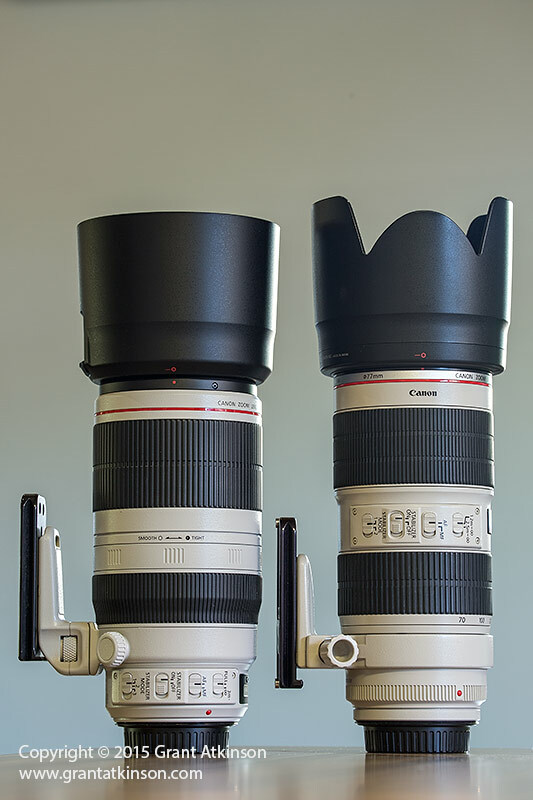 Canon EF 100-400L f4.5-5.6 IS ii in retracted form, on the left, with a Canon EF 70-200L f2.8 IS ii alongside, for size comparison purposes. Note opposite location of zoom and focus rings. Both lenses fitted with lens plates by me. Click for larger view. After six months of reasonably hard use, the zoom action of my EF 100-400L 4.5-5.6 IS ii has loosened up ever so slightly. With the tension ring set to its softest setting, the lens barrel extends very slowly when held vertically downwards, and not quite all the way to 400mm. Tightening the tension ring just a fraction instantly firms that up. Setting the tension ring is quick and easy, and allows me to lock the lens at any focal length I might select should I wish to maintain that focal length. I can also tighten up the lens in its retracted position for travel. I back the tension ring off for shooting as I like the zoom action to be as light as possible. I prefer the new tension ring design over the lock switch found on some other lenses for a number of reasons. With the ring, you can set the zoom friction so that it stays firmly where you leave it, but can still zoom it out or in quickly if the need arises. With a locking switch, it is all too easy to forget that it is locked when you need to shoot in a hurry. Beyond that, the new tension ring design means that even if the zoom action loosens up over time, simply dialing in a little more tension will maintain friction control perfectly well. The manual focus ring is located closer to the camera body, and turns very smoothly. I only rarely use manual focus and hardly ever when photographing wildlife. Some photographers like to make use of the manual focus ring to bring a subject partially into focus, before making their final adjustment with autofocus. The focus ring rotates with such a smooth action it almost feels hydraulic. 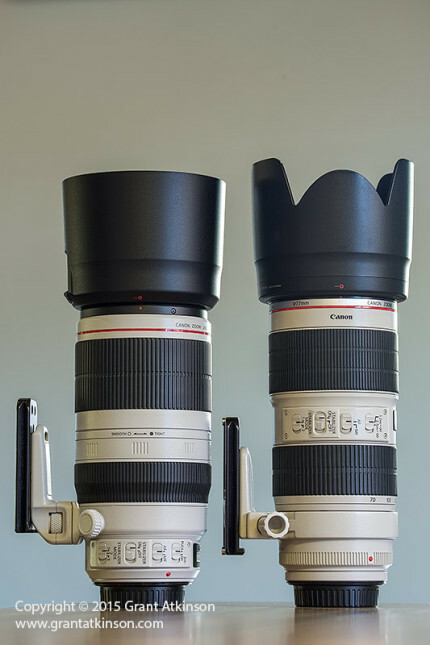 Canon EF 100-400L f4.5-5.6 IS ii in retracted form, on the left, with a Canon EF 70-300L f4-5.6 IS also retracted, alongside, for size comparison purposes. Note similar location of zoom and focus rings. Both lenses fitted with lens plates by me. Click for larger view. It is worth noting that the location of the zoom ring and focus ring on the new EF 100-400L f4.5-5.6 IS ii are the same as on the Canon EF 70-300L f4-5.6 IS. This orientation of the control rings is opposite to that found on the Canon EF 70-200L f2.8 IS ii. For tripod use, the EF 100-400L f4.5-5.6 IS ii should be set up with the tripod foot attached to the tripod (rather than attaching the camera to the tripod and having the lens dangle off it). 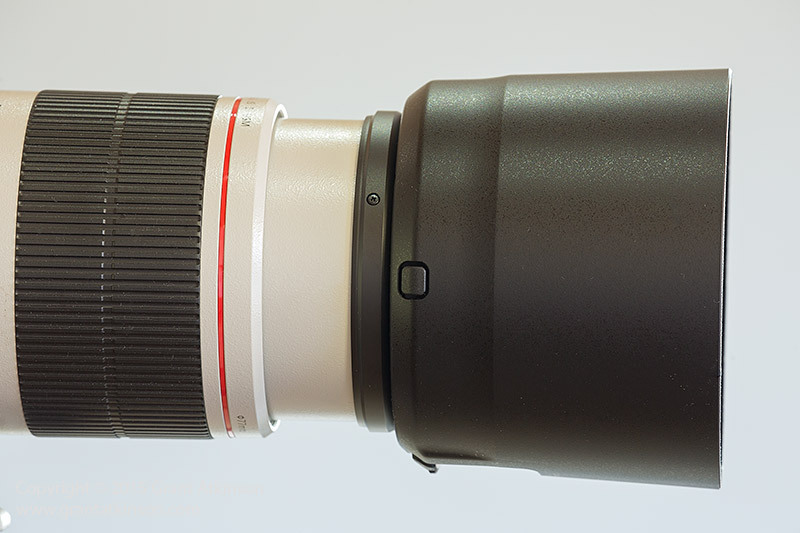 The integral tripod collar works much more smoothly than any other Canon mid-series zoom lens before. In fact it’s silky rotation and locking function feel almost like those on the much more expensive super telephoto fixed lenses. The tripod collar on the new 100-400L is marked with a black line that helps with alignment. There are no detent clicks in the collar’s rotation like those found on Canon’s high-end super telephoto lenses. When suspended on a gimbal mount, zooming in or out changes the balance point of the lens very slightly. I usually set it up to balance best at the focal length I expect to be using the most. The EF 100-400L f4.5-5.6 IS ii is 5 mm longer and 2 mm wider overall, compared to the old lens. It is also a little heavier than the original EF 100-400L. In this, it follows the EF 70-200L f2.8 IS ii, which was also a little heavier than its predecessor. Whilst I am not overly excited about lenses getting heavier, the new EF 100-400L f4.5-5.6 IS ii seems an even better-built lens than the older model. This assumption is borne out by Lensrentals’ teardown of the new zoom. 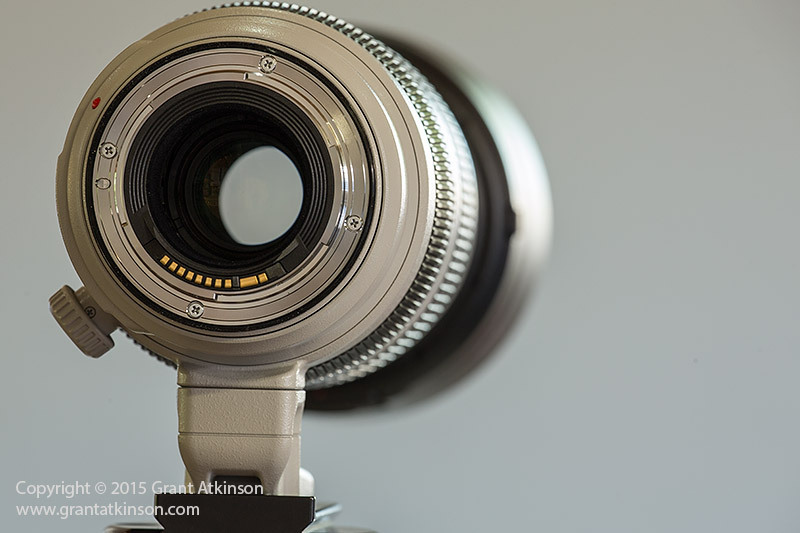 In this post, Roger Cicala describes the new lens to be one of the most robust and well-engineered zoom lenses he has ever seen. Bigger bearings, shims, fittings and other components should make this lens tougher and longer-lasting, and justifies the weight increase of around 280 grams over the old lens. The new lens also has significantly improved weather-sealing, according to Canon, when paired with a similarly resistant body, and a front filter element in place. Any improvement that helps keep dust and moisture out for longer, is something that I need. Right now, after six months of hard outdoor use in conditions ranging from Kenyan dust to Indian Ocean spray, my own EF 100-400L f4.5-5.6 IS ii is not showing any sign of dirt or moisture getting between the elements. * As an update from 2019, Helena and I each have our own EF 100-400L f4.5-5.6 IS ii. They work very hard for us and get used at least 100 days in a year, sometimes more. Although we can see some fine dust particles inside if we look through the front element in bright light, those dust particles don’t seem to show up anywhere we can notice on our images. So we have not worried about it. The new lens hood has a locking tab which clicks into place when attached, and is overall, a much better design than the same part on the original EF 100-400L. On the older lens, the lens hood used to become so loose and rattly, that it could even fall off when in use. That appears to be a problem of the past. My new lens has show no sign of wear so far. The sliding access window on the new hood might be a useful feature for those who use filters on the end of the lens that need adjusting (like a polarizer) but I am not one of those. Instead, I found the access window to be very easy to nudge into an open position whilst shooting, so I have taped mine in place to prevent this happening. The new lens hood provides good protection for the front element, helps prevent flare very well, and is something I keep in place all the time when carrying this lens. Despite the weight increase, the new 100-400 still feels and handles like a mid-size telephoto zoom. In this it is differentiated from the much bigger and heavier Canon EF 200-400L f4 1.4x IS. It is also smaller and lighter than any of the new Tamron or Sigma 150-600mm zoom lenses. I put the EF 100-400L f4.5-5.6 IS ii to work in a wide range of wildlife photography situations. 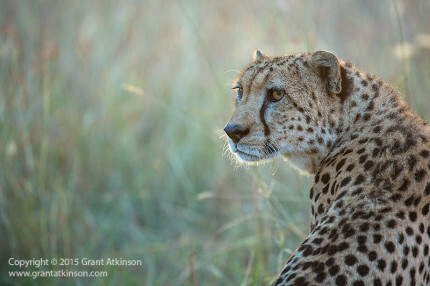 It has quickly become my first choice zoom lens on the photographic safaris I lead all over Africa. I like to pair it with an EF 500L f4 IS ii. For those trips where space is limited, or weight of equipment a critical factor, then I am happy to travel just with the 100-400L and a wide angle lens. I still have an EF 70-200L f2.8 IS ii but I don’t carry that together with the 100-400, rather choosing only one of those two. The only time I prefer the 70-200L f2.8 IS ii over the longer zoom lens is when I am expecting to be shooting in very low ambient light. I find that the focal length range of the EF 100-400L f4.5-5.6 IS ii to be sufficient to deal with most of the mammal photography that I do. Of course, the wide zoom range means that multiple images can be created from one position just by changing focal length. It also means that careful framing minimizes how much cropping I may need to do. For bird photography, the focal length range of 100-400mm is enough for very big birds, or those that are easily approachable. I often find that I need more than 400mm for smaller birds or those that are further away. 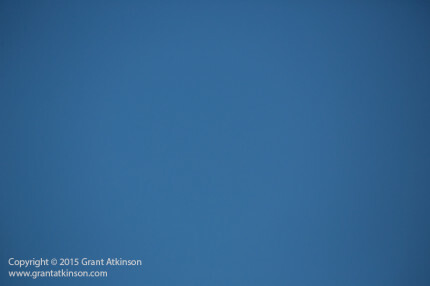 That is one reason why I pair my EF 100-400L with a fixed 500mm lens on many of my excursions. With its 98cm minimum focus distance, the new EF 100-400L IS ii is the best lens I have used yet, for handheld. up-close photography. I am always on the lookout for the chance to get close, or low with wildlife subjects that will tolerate such proximity. This would include approachable birds, reptiles and large insects like butterflies and dragonflies, as well as mammals. Sometimes when I am very close, it can be important to make no noise at all, and limit my own movements, so as not to startle off my subject. In such instances the new EF 100-400 is most effective, with its light weight, quiet focus and unobtrusive zoom action making it very ‘stealthy.” I am finding that the very short (0.98cm) minimum focus distance is helping me come away with close-up images that are cropped much less than ever before and some not at all. When you can avoid cropping, it really makes the most of the image quality. 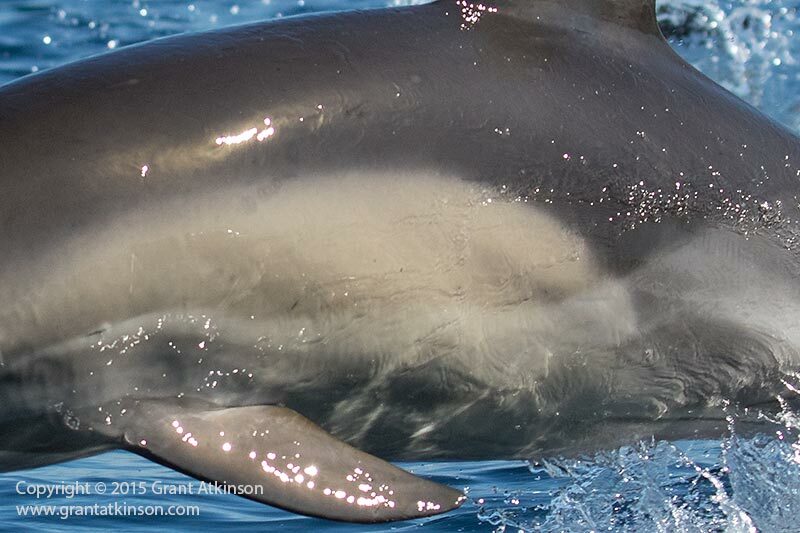 The EF 100-400L f4.5-5.6 IS ii has become my first choice lens for taking photographs of marine wildlife, from boats. The easy handling of the lens, combined with its fast autofocus, make it a natural choice for this kind of photography. The extra focal length of the new zoom is a significant advantage when compared to the two lenses I used previously for this kind of shooting, the EF 70-200L f4 IS and the EF 70-300L f4-5.6 IS. The short minimum focus distance also comes in handy if subjects make a close approach. 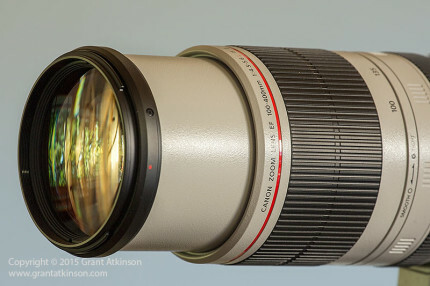 It should be noted though that for prolonged marine work, lenses with extending barrels may be more susceptible to salty moist ocean air getting inside over time, when compared to zoom lenses with internal workings only (like the Canon EF 70-200L f2.8 IS ii) and fixed telephoto lenses. 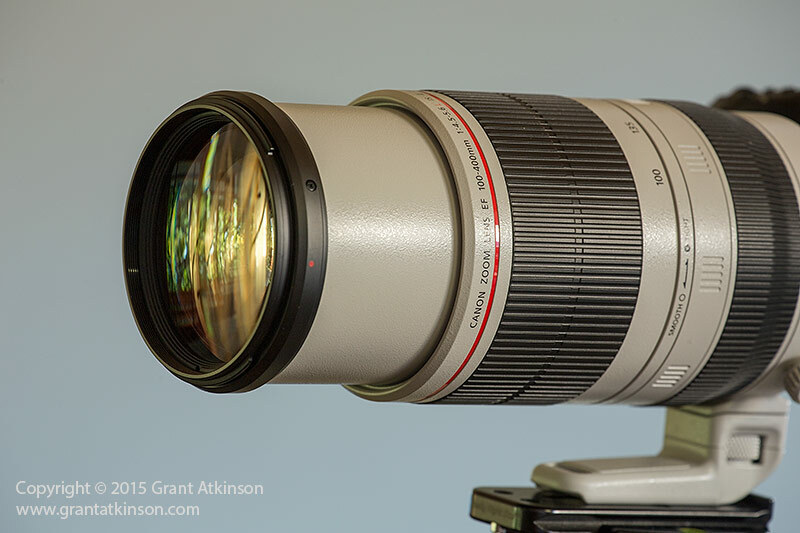 The minimum aperture of the EF 100-400L f4.5-5.6 IS ii is f40 on a Canon 5Dmk3. This can be quite useful when I am trying to get a very slow shutter speed, in bright conditions. I use the small apertures for motion blur shooting. The close focus distance, high magnification ratio and wide range of focal lengths have made the new EF100-400L f4.5-5.6 IS ii an ideal tool for my own product photography, which consists chiefly of photographing camera gear at close range for review purposes. Other uses that spring to mind, if not my own photographic genre, are daylight sports or well-lit sports, air shows, outdoor action activity and landscapes. This lens has Canon’s latest iteration of their IS system, effective for 4 stops, and with three different user modes, making it basically identical to those found in the version two super telephoto lenses. This means it is quieter, quicker and more effective than before. 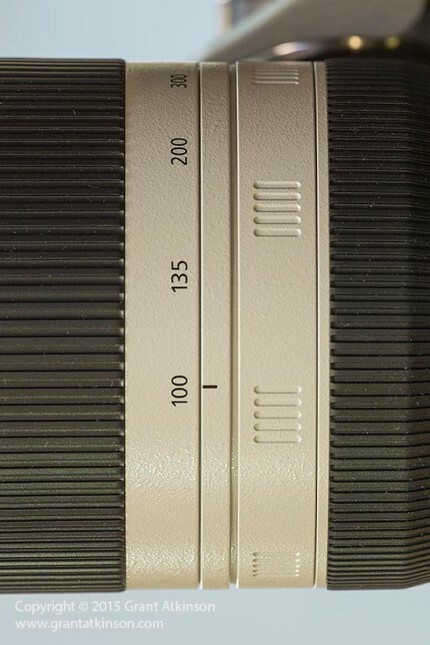 The new IS start-up time is just 0.5 sec, compared to 1.0 sec in the old lens. The only sound it makes is a very soft whirring, and it is so quiet that I have to concentrate to hear it. With four stops of assistance, I find that I am getting sharp shots at much lower shutter speeds than I would expect to. 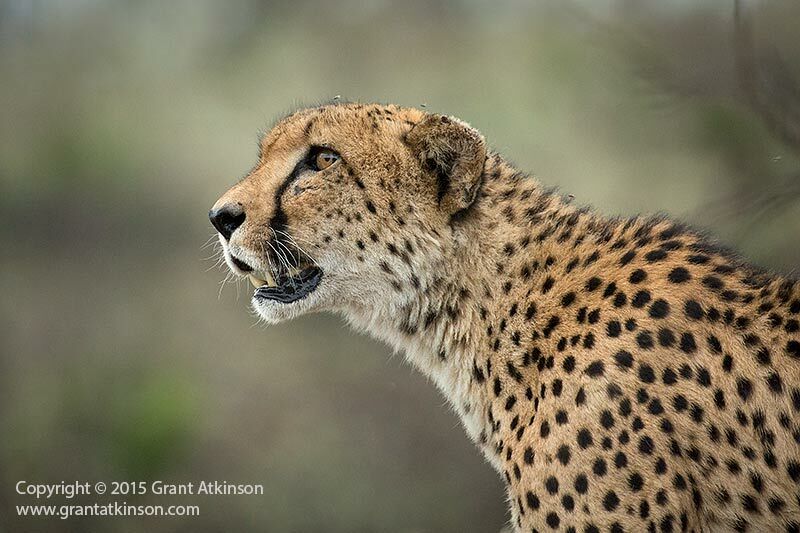 The cheetah image above was taken at just 1/30 second, whilst handholding the EF 100-400L ii with a 5Dmk3 attached at 400mm of focal length. It is just one real world example of how good new generation IS systems are. I was pleasantly surprized to come away with this image, given how slow the shutter speed was. With the new IS system, Mode 1 detects and counters movement in two planes, horizontal and vertical. I use this mode a lot of the time. Mode 2 has new algorithms that reduce problems when panning. In this mode, the IS detects and counters movement in one plane only, which is ideal for panning. This mode is meant to be used when you don’t expect any up or down movement of your camera and lens, for instance when on a tripod or fixed mount. Mode 3 is like Mode 1, in that it counters both horizontal and vertical movement, but where it differs, is that it is not active all the time. In this mode, activation only takes places just before the image is taken. According to Canon, this is especially useful for wildlife photography or sport photography, where one may be moving between subjects quickly. I use Mode 3 often when handholding, and have found that I am comfortable with the results I get with Mode 1 and Mode 3. Which one works best for you might come down to personal preference. Mode 3 is meant to prevent instances of the image shifting around in the viewfinder during IS operation, but this is not something that I encounter much. The IS system in the EF 100-400L f4.5-5.6 IS ii is tripod-sensing, which means that when it is mounted on a tripod, it will automatically de-activate stabilization. On the older generation of IS lenses you had to remember to turn off IS yourself, if you did not want it active at the time. When it comes to image stabilization, my opinion is formed from my experience shooting mostly with Canon L-series lenses and Canon dslr bodies. Image stabilization is an invaluable feature for me. Much of my shooting is done handheld, and often in a bit of a hurry, and Canon IS helps me get more sharp shots. New generation stabilization units like that found in the new EF 100-400L f4.5-5.6 IS ii take effectiveness to a new level. I keep IS on all the time when handholding, and I use the modes as outlined above. Whilst there are some folk who insist that IS can affect image quality and autofocus performance negatively, I am not one of those. Even in bright light, when I may be shooting with shutter speeds that are faster than 1/2500sec, I keep it engaged. I firmly believe that the modern, sophisticated IS systems help smooth out what I see in the viewfinder, correct my own handholding shake, and also help with dampening camera vibration. Autofocus is a strong point of this lens. This is an aspect of lens performance that matters a whole lot to me. As a wildlife shooter with a liking for moving subjects, and one who uses autofocus all the time, I need it to be accurate, and fast. Whilst lots of modern lenses will focus quickly and accurately on stationery subjects in good light, moving subjects present a much more difficult challenge for autofocus. I can say that the EF 100-400L f4.5-5.6 IS ii is easily good enough at autofocusing wildlife subjects, even fast-moving ones! At the time of writing, I find the EF 100-400L f4.5-5.6 IS ii to be best-focusing, maximum aperture f5.6 lens I have used. It has far exceeded my expectations in this regard and I have full confidence in using it for any wildlife action I may be photographing. I also shoot in low light a lot, and whilst I would prefer to have a lens with a larger maximum aperture in those situations, the EF 100-400L f4.5-5.6 IS ii can do the job. In comparison with other Canon lenses I use for wildlife, it focuses at least as fast as the Canon EF 70-300L IS, despite the bigger, heavier elements and the extra distance that these optics need to be moved on the bigger lens. Perhaps only the EF 200-400L f4 IS 1.4x and the EF 70-200L f2.8 IS ii focus faster amongst the Canon zoom lenses I use for wildlife. It is obviously still bested by the fixed super telephoto lenses like the EF 300L f2.8 IS ii in absolute focus speed and accuracy. When it comes to autofocus accuracy, I have found that I get my best results using a manually-selected, Single AF point. On the 1DX, 5Dmk3 and 7D mk2, which are the three camera bodies that I have used the most with this lens, I have found that I can use any of the AF points on the grid for static or slow-moving subjects. Wildebeest, Masai Mara. Canon EF 100-400L f4.5-5.6 IS ii and 5Dmk3. Single AF point on outer row of AF points selected by myself, static subjects. Ai Servo. Shutter speed 1/1600sec at f7.1, iso 160. The wildebeest above were standing still, and the outermost AF point worked perfectly well. For fast-moving subject matter, I am finding that I get my best results using a Single AF point, with best results from the inner core of points. Lion, Masai Mara. Canon EF 100-400L f4.5-5.6 IS ii and 5Dmk3. Single AF point not on outermost perimeter of AF points selected by myself, fast-moving subject. I stopped down to f7.1 to give myself more depth of field, to allow for my own inaccuracy with AF placement, which was meant to be on the lion’s eye. Ai Servo. Shutter speed 1/3200sec at f7.1, iso 800. With this lion approaching me quite rapidly, I wanted one of the upper AF points in the grid, so as to allow more room for his legs. In my experience I get higher levels of accuracy with this lens, from any of the AF points except those in the outermost row, when I am photographing fast-moving subject matter. Autofocus is not only fast on this lens, but also exceptionally quiet. There is a focus distance limiter switch, with settings from 3m to infinity, and from 1m to infinity. Using this limiter can speed up autofocus even more, if you are certain your subject matter won’t approach closer than 3m. I keep my lens on the Full setting, which allows it to focus from 0.98m (minimum focus distance) out to infinity. As I use my gear for a wide range of subject matter, and do sometimes get closer than 3m, I prefer to keep my options open. The last thing I want to have happen to me is to have my lens stop focusing because the subject may be too close, and I end up missing the shot because of that setting. I find the EF 100-400L f4.5-5.6 IS ii to focus fast enough even with the full focus range enabled. I used the EF 100-400L f4.5-5.6 IS ii on a variety of Canon camera bodies, with different sensor sizes. On the Canon 7Dmk2, with its APS-C sized sensor, the field of view is roughly equivalent to 160mm to 640mm This pairing performed at its best when the ambient light was at moderate to bright levels, with very fast and accurate autofocus, and good resolution. For bird photography the extra fine resolution of the 7Dmk2 sensor was advantageous if the subjects were smaller in the frame or far away. On the Canon 5Dmk3, with its 35mm full-frame sensor, the 100-400mm focal length range was noticeably wider and more useful for capturing surroundings and environments than on the 7Dmk2 or even the 1Dmk4 (1.3x field of view crop). The good low-light image quality from the 5Dmk3, even at higher iso settings, meant that I feel comfortable using this camera on the new EF100-400L f4.5-5.6 IS ii whenever the light levels were low. 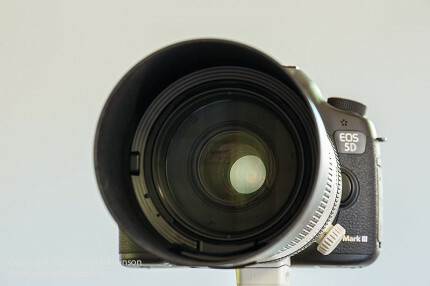 Mounted on the Canon 1DX, the full-frame field of view was identical to that of the 5Dmk3. It was my feeling that the 1DX drove the lens autofocus very quickly and positively. It was also the most capable combination for very low light shooting. I also used the new lens on the Canon 7D and 1Dmk4, both discontinued now, with good results. I always shoot in RAW and process my images using Adobe Camera Raw 9 (CC) or Lightroom CC, and I finish them off in Adobe Photoshop CC. My evaluation of this len’s image quality is based upon this, my standard workflow. 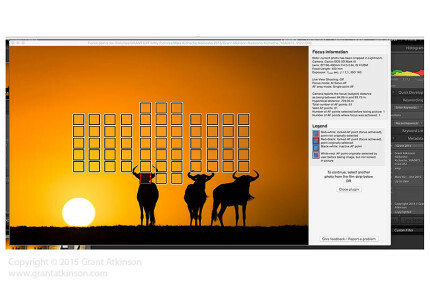 I do also have Canon’s excellent Digital Photo Professional software, but find that its lack of selective editing is a drawback for my workflow and subject matter. I am finding that images taken with the EF 100-400L f4.5-5.6 IS ii are of high quality, both in terms of sharpness, colour, and contrast and are almost as good as those produced by the EF 70-200L f2.8 IS ii. I find it quite difficult to actually tell images from those two lenses apart until I read the metadata, on my 23-inch editing screen. The new lens is so sharp that there is no need to close down the aperture in order to improve sharpness. In fact, I shoot my copy of this lens at the wide-open aperture setting around 80 percent of the time. This is a necessity due to the low levels of ambient light that I often shoot in, as well as a desire to blur distracting backgrounds. The fact that I can shoot it wide-open with no penalty in image quality is a big plus for me. The lens also produces sharp images throughout the zoom range. Images at 400mm focal length appear equally sharp to those from the middle of the focal length range. What further improves image quality from this lens is the accurate focus it achieves when paired with the 1DX bodies, the 5Dmk3, 5DSR and 7Dmk2. Properly-focused images are higher in contrast, and show fine details so much better. I used to find that at times with the older EF 100-400L f4.5-5.6 IS, I needed to take several images of a subject when shooting wide open, just to be sure that I would get at least one sharp image from the sequence. With the new lens, that is no longer the case..and the image quality benefits are clear to see. I only ever mount any kind of screw-in filter to this lens like a UV Haze or protective clear filter, to the front of this lens when I am shooting in extremely adverse conditions that might be damaging to the lens. An example of this would be when photographing on or near the ocean, when the filter would be keeping airborne salt-laden spray off the front lens element. I find that filters can have a negative effect on overall image quality. Usually the deep lens hood does a good enough job of keeping the front element safe and clean. It is quite normal for zoom lenses to show some evidence of vignetting, or darkening of the edges of the frame. It is typically most pronounced at the extreme ends of the zoom lens range, and at wide-open apertures. I photographed a blue sky on a clear day, using a full-frame Canon 5Dmk3 to illustrate the vignetting. At 100mm focal length, and aperture wide-open at f4.5, vignetting is mild, and only apparent in the corners of the full-frame image. At 100mm focal length, and aperture stopped down to f5.6, vignetting is almost all cleared away from the corners. At 100mm focal length, and aperture stopped down to f7.1, no signs of any vignetting at all are visible. Changing the focal length to the other extreme of the zoom range, 400mm, shows more vignetting. At 400mm focal length, and aperture wide-open at f5.6, there is moderate vignetting in the corners of the full-frame image. At 400mm focal length and aperture stopped down to f6.3, clears away some of the vignetting from the corners of the image. At 400mm focal length, with the aperture stopped down to f7.1, vignetting is further reduced in the corners of the image. This trend continues until at f8 to f11 the vignetting is hard to discern at all. 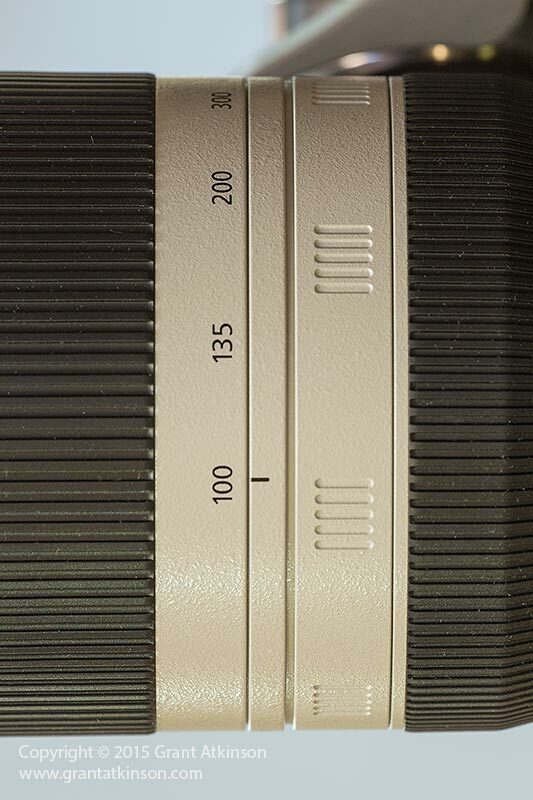 When used at wide-open aperture settings, the EF 100-400L f4.5-5.6 IS ii shows some moderate corner shading. The shading is mild at 100mm, and moderate at 400mm, when it is noticeable in blue sky or bright background images. Stopping down even one stop clears it significantly. By comparison with the original EF 100-400L, the new EF 100-400L f4.5-5.6 IS ii shows less vignetting at every focal length and aperture setting. This is a contributing factor to the improved image quality over the old lens. In real world use, the vignetting at 100mm is hard to notice. At 400mm and f5.6, it is noticeable when photographing against bright or clear backgrounds. Slight vignetting such as this can actually help to draw attention to my wildlife subjects which are not typically positioned anywhere near the very edges of the frame. It is also very simple to get rid of the vignetting using Adobe Lightroom (Lens Corrections tab), or Adobe Camera Raw, Photoshop or Canon DPP. If you like shooting jpg images, many Canon dslr bodies deal with vignetting, via the Peripheral Illumination Correction feature, in camera. When used on a camera with an APS-C (crop sensor) like the 7Dmk2, the vignetting is barely noticeable, even at 400mm and wide open. This is because the outer edges of the image circle, where the vignetting is most pronounced, are not captured on the smaller sensor. Bokeh on the new lens is improved, compared to the original EF 100-400L f4.5-5.6 IS. It has a less busy look to it. Shot at wide-open aperture settings, the EF 100-400L f4.5-5.6 IS ii can blur out background details quite effectively. It helps if you can get quite close to the subject, and distant backgrounds blur easier than close backgrounds. 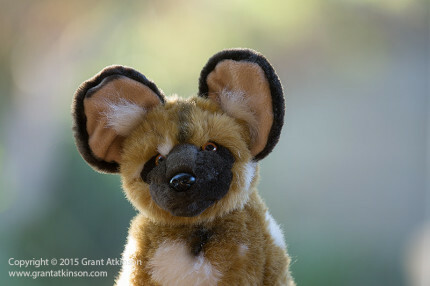 For subjects that are near enough to be approaching the lens minimum focus distance, background blur is strong, especially at the maximum focal length. There are quite often times, especially when subjects are further away, or the background cluttered, that I do miss not having a maximum aperture of f4.0 at 400mm, but of course, that requirement is met by a different lens, the EF 200-400 f4 L IS 1.4x. The EF 100-400L f4.5-5.6 IS ii is also a little brighter than its predecessor, as it holds an f5.0 aperture right up until 305mm, whereas the old push-pull lens at f5.0 only went to 230mm. After taking thousands of images with the lens in the field, I am not finding chromatic aberrations are something that I need to worry about at all in normal use. There is one exception though, with chromatic aberrations being evident when I am shooting marine mammals in very bright light. In these images the common dolphin has just leaped out of the ocean, and has a layer of water over its body. The water acts as a mirror, and in those places where the reflections are brightest, creates overexposed areas with chromatic aberrations (mostly purple) around the edges. In the image above the purple fringing is visible around edges of the highlight areas on the dolphins pectoral fin. In the image below, the fringing has been removed, using Adobe Lightroom Lens Correction tab. These chromatic aberrations are only something I encounter when shooting in this extreme high-contrast scenario. I get similar chromatic aberrations in these conditions with the EF 70-200L f4 IS, and the EF 70-300L f4-5.6 IS, my other marine mammal lenses). That said, the chromatic aberration is easily cleared away using software. I also prefer to shoot in conditions with less harsh light, when the ultra-bright reflections are not a problem at all. Whilst it is possible to make the EF 100-400L f4.5-5.6 IS ii show flare when shooting with the sun in the frame, it resists flare very well, especially for a zoom. 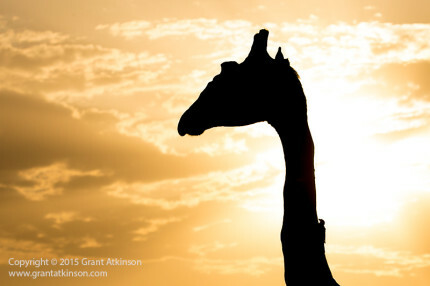 You can shoot towards the sun, so long as there is some form of filter or obstruction (in this case some thin cloud and a giraffe) to block the most intense sun rays. Like most lenses, there may be a slight loss of contrast in images taken in such a fashion. The new 100-400 performs similarly to Canon’s other recent L-series telephoto zooms, with actual lens flares being greatly reduced. This is an area of big improvement over the older lens. It seems likely that at least some of the improvement in the new lens ability to shoot better with back lighting comes from the lens coatings used in the optics. As a general comment here, I remember how difficult I used to find shooting backlit subjects with my old (discontinued) EF 70-200L f2.8 IS (which was a good lens for the most part). The image in the viewfinder would get hazy, the autofocus would rack back and forth, and if I did manage to get it focused, the images usually had a major loss of contrast, and often unsightly flares all over. Modern Canon L-series lenses like the new 100-400L have made it much easier today. This lens is designed to be able to accept EF extenders. I chose to test it with the EF 1.4x iii extender only, and not with the EF 2x iii. With the 1.4x extender in place, the maximum aperture at 560mm becomes f8. At the time of writing, regular autofocus (through the viewfinder) is only available on the 7Dmk2, 5Dmk3, 5Ds, 1DX and most older 1D bodies. The lens and extender performs much better than i expected, and can certainly be useful when photographing in good light, and for distant subjects. On the 1DX, the 5Dmk3, and the 7Dmk2, autofocus is limited (through the viewfinder) to only three AF Modes : Single Point AF, Spot AF and Expanded AF (1 Pt + 4 surrounding). Also, the focus point/s are locked, and you cannot move the AF point around. If you switch to Live View, you can move the AF point wherever you want. Earlier 1D Canon bodies perform in a similar way to the three bodies listed here. I also tested the lens and extender combination with a 7D (mk 1) attached, and viewfinder autofocus did not function. However, it was possible to use Live View on the 7D to achieve focus. I was quite surprized by the image quality delivered by this combination. The test images of my static subject, were easily sharp enough for print. I also compared the image quality from the 560mm f8 zoom lens and extender, to that from my EF 500L f4 IS ii in the same light, with the same camera body. I was quite startled at how close the zoom lens and extender was. Of course, my subject distance was short here, and shooting at such short distances, and from a tripod always seems to minimize differences between lenses and cameras. I usually find that the smallest differences in tripod-shooting testing tend to become bigger when using the gear in the field. Nonetheless, using the EF 100-400L f4.5-5.6 IS ii with the EF 1.4x extender is a viable option when the light is good enough. I usually expect moving subject photography to be more challenging with an extender in place. I have not, as yet done much of that kind of shooting with this combination. 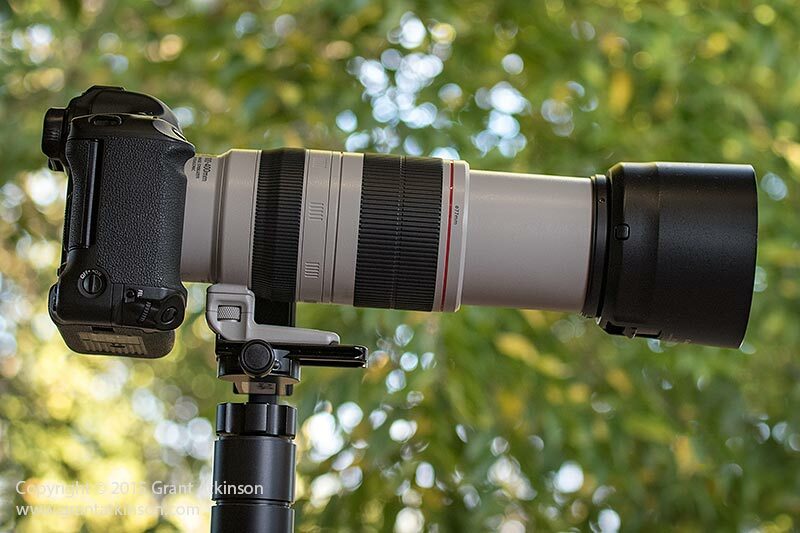 I have seen some pretty decent images of birds in flight, (mostly bigger, slower species) showing up on the web, from other photographers using this outfit, so the lens and extender combination seems quite capable. I may expand the information on extender use the coming months. Within the Canon L-series range there are a number of options. Perhaps the lens most similar to the new EF 100-400L f4.5-5.6 IS is the Canon EF 70-300L f4-5.6 IS. Image quality, autofocus speed and accuracy are very similar, as is the level of weather-sealing. The EF 70-300L is noticeably lighter, at 1050g (without tripod ring), and a lot more compact, especially when in retracted form. It also costs less, but the tripod ring is not supplied as standard. The 70-300L has a 30mm wider focal length, but gives up 100mm on the long end. The EF 100-400L has a magnification advantage with its 0.98 minimum focus distance. Both lenses have excellent image stabilization systems, though the EF 100-400L is slightly more sophisticated in this regard. The EF 70-300L costs a lot less, at approximately USD 1350. Another lens that may be considered an option is the EF 70-200L f2.8 IS ii. It enjoys a wide-open aperture advantage that can help a lot when shooting in low light. The barrel does not change shape during zooming, which should mean a more robust design, with perhaps superior resistance to dust and moisture. It may focus a fraction faster. Image quality and autofocus accuracy are very similar and not necessarily a differentiator. Image stabilization is similar in the two lenses, though the new EF 100-400L has a slight advantage in its system. At 1490g with tripod ring, the EF 70-200L f2.8 IS ii is a little lighter than the EF 100-400L f4.5-5.6 IS ii at 1640g. It cannot focus as closely as the new 100-400L, and at 200mm, is clearly an entirely different lens for different requirements with only half the focal length. 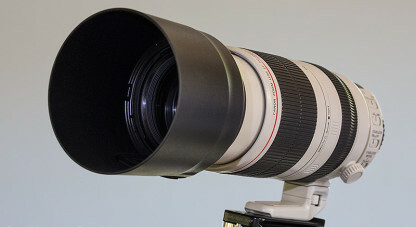 However, many photographers fit the EF 70-200L f2.8 IS with a Canon EF 2.0 extender, which turns it into a 140-400 f5.6, a focal length comparable to the new 100-400L. Whilst this extender and lens combination does a good job, I believe that the EF 70-200L f2.8 IS ii and EF 2x iii will be outperformed in focus speed and accuracy, in image quality, in size and weight and general handling by the new EF 100-400L ff4.5-5.6 IS ii. Cost of these two lenses is about the same, approximately 2200 USD, without the added cost required of the EF 2x Extender iii at USD 500. The EF 28-300L f3.5-5.6 IS is another Canon L-series zoom lens that might be taken into consideration. It’s main advantage over the new EF 100-400L is it’s much wider focal length of 28mm, which gives it some ‘one lens to do it all’ appeal. It works with a sliding zoom mechanism (like the original EF 100-400L IS), and weighs about the same as the new EF 100-400L IS ii. In comparison, the EF 100-400L f4.5-5.6 IS ii focuses much faster and with greater accuracy, can focus much closer, has superior image quality over the shared focal length range and has superior image stabilization. Cost is quite high for this lens, at approximately USD 2500. I also compared the new EF 100-400L f4.5-5.6 IS to what I consider the very best Canon L-series zoom lens for wildlife, the s EF 200-400L f4 IS 1.4x Ext zoom. The EF 200-400L f4 1.4x produces slightly better quality images when it comes to sharpness and contrast, by a small but noticeable margin. It also holds a significant maximum aperture advantage at 400mm and f4.0, which can help in low light and for blurring backgrounds. Autofocus speed and accuracy are pretty close, perhaps the EF 200-400L is a fraction quicker (without the extender in place). The EF 200-400L holds a 160mm focal length advantage at full zoom, with extender engaged, which is significant. With internal zooming, it is most likely also a little more resistant to dust and moisture entry. 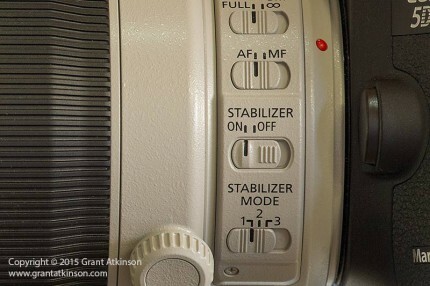 Image stabilization systems are very similar between the two lenses. In comparison, the new EF 100-400L f4.5-.56 IS ii is much lighter, much more compact, and way easier to manage. It has a wider field of view, at 100mm, and it can focus closer at all focal lengths than the bigger lens. If you need that extra f-stop at 400mm, and the extra 160mm of lens, along with the very best zoom-lens quality that Canon can produce, then the EF 200-400L f4 1.4x IS is the lens for you. It costs significantly more, at approximately USD 11 000. The original EF 100-400L f4.5-5.6 IS has similar specifications and focal length and as at mid-2015, can still be bought new for approximately USD 1500. Throughout this review I have used the older lens as a reference for comparison, so reading the full review should help decide which one suits you better. The EF 400L f5.6 is a fixed telephoto lens that offers yet another choice. It is lighter than the new EF 100-400L f4.5-5.6 IS ii. They only overlap focal lengths at 400mm, and share maximum apertures of f5.6. Image quality between the two is very similar, with the new zoom looking every bit as sharp to me. The new EF 100-400L f4.5-5.6 IS ii focus is more accurate, and maybe faster. 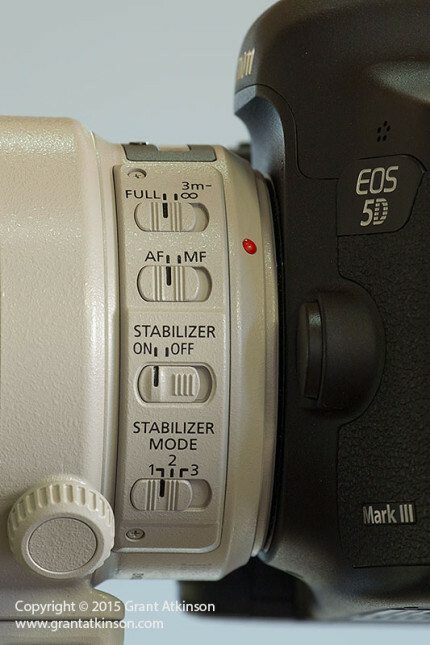 The image stabilizer allows the zoom lens to outperform the fixed lens, which lacks image stabilization, in most handholding scenarios. The zoom is obviously more versatile with regard to focal length than any fixed lens, and it can focus much, much closer than the fixed 400mm lens can. Cost of the EF 400L f5.6 is attractive though, at approximately USD 1350. A couple of non-Canon options are also worth mentioning. I have had several readers write to ask me how the recently released super-zooms from Tamron and Sigma perform, especially in comparison to the new Canon EF 100-400L. Unfortunately, I am unable to answer those questions properly. My testing regime usually involves months of shooting in the field, and the Tamron 150-600 as well as both Sigma 150-600mm zooms have maximum apertures of f6.3. For my use which involves lots of handholding, I find those apertures too slow for the kind of shutter speeds I know I need. I photograph a lot of mammals in very low light, sometimes after sunset, and with current sensor technology, f5.6 is as slow a maximum aperture as I can afford to go. So I won’t be using them in the field right now. From the little I have seen all of the Sigmas and Tamron look capable of producing very nice images. In use, the EF 100-400L f4.5-5.6 IS ii has moved itself significantly upward in my estimation, compared to the lens that it replaces. With such an array of advances, performance is improved significantly in virtually every aspect of performance, and especially those that matter most to my shooting style. This lens has definitely closed some of the gap that exists between zoom lenses and fixed lenses in image quality. Of course, as good as it is, the moderate maximum aperture obviously does place some limits on what it can achieve. That needs to be offset against it’s compact and relatively lightweight form, which may be one of its most important attributes for some photographers. As a package it does much more than I had hoped it would. It has fast become one of those pieces of gear that I am excited to use, as I have full confidence that it will get me the shot. Hi Grant, Sold my 100-400L yesterday and bought the new model today. This was before having read your glowing report that a fellow photographer sent me this afternoon. It really made me feel good confirming that I had made the right decision. Can’t wait to try it out in the KNP next week ! Hi Stephen, thanks for the feedback, I hope you get some great shots with the new lens. Yours are the very best reviews available, especially for wildlife applications. My own observations in shooting sports are consistent with yours, although I’m much less informed. I remain very grateful to you for taking the time to provide such informative and useful reviews: no jargon or useless pseudo-science. For our trip to Tanzania next month it looks very much like we’ll have the new 100-400, a 300 2.8 and also a rented 200-400 (since there will be three of us shooting). It will be interesting if we’re able to detect any real world differences in image quality or focusing. Again, many thanks for the best reviews anywhere. Thanks for the good feedback. I am fortunate in that I get to use whatever gear I am traveling with quite extensively in all kinds of wildlife scenarios :-). Posting the reviews is enjoyable for me, and if it helps others get a better idea of the gear and the shooting requirements, that is great. I love your reviews! Even though I have this lens I read the entire thing. Your writing is always well written and easy to understand. Your glowing review was well worth the wait, feeling more confident about my purchase. So that Helena and I each have our own..
Great review Grant! Greatly anticipated and read with interest! I am currently shooting a 70-300 L and 500 F4 on a 5D3 and 7D2. I suppose in this situation I have no need for the 100-400. But it really does look like a solid choice for trips I cannot take the 500F4 on. I love the compact size of the 70-300 and actually, the wide end. I fear some of my tighter landscapes, which are often snapped with this lens while looking for wildlife, would suffer. Hi Will, thanks for the feedback on the review. I read your gear list with a smile, and I understand all your reasons. 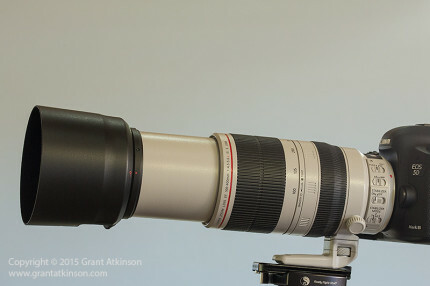 Hi Grant, an excellent rendition on the 100-400 Mkii. It is more like a thesis, well done! I am sold and feel a traitor to my best lens 70-200 Mkii. Incidentally ORMS Cape Town is substantially cheaper than B and H Photo. That’s a great review with lots of pertinent real life scenarios as examples of the lens in use. I agree with others that your reviews are very good indeed. I too have been using this lens for six months now, and in fact was sing it on safari in Kenya (when we briefly spoke out in the field as our vehicles passed). 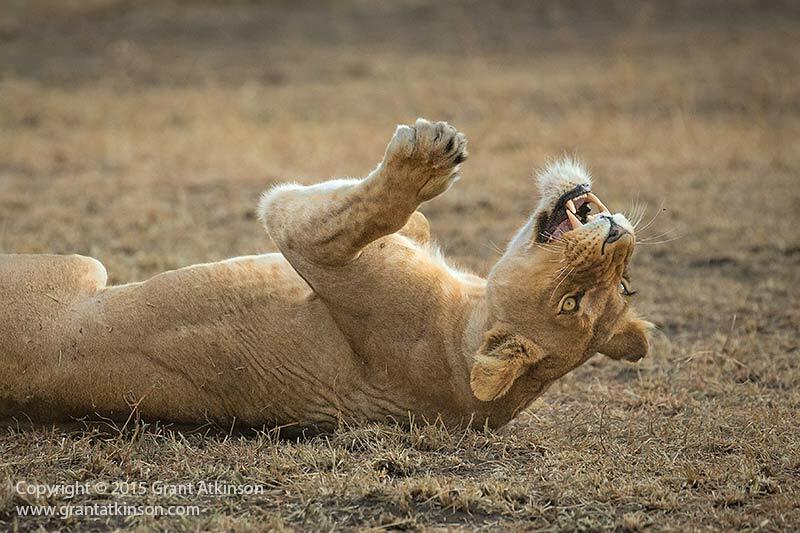 For a safari lens I found that the versatility was a terrific asset, I shot some real tight shots of lions close up on a 5DMKIII and every little hair was evident. I also used it for some kingfishers on my 7DMKII and that worked well too. I am a great lover of backlit shots and the lens was so much better than my old 100-400 that used to hunt and often producing soft images. I was so pleased with the outcomes of this lens. To add to your review, I can say that this lens is also very useful for close up work. I do quite a bit of butterfly photography and the close focusing capability of the lens is immensely useful to me. Some species are canopy loving so the longer 400 mm length comes into play, but when egg laying they can come down to lower branches and allow close up shots of something like three or four feet. This lens allows me to shoot both scenarios. On the close up shots of the butterflies you can see the detail of their furry bodies – incredible. It also allows me to get close ups of some more nervous creatures like dragonflies. Being able to zoom in or out on a subject at close range is very liberating. I have also tried this lens with a 2x MKIII convertor on a 7D MKII. I was handholding and photographing some sparrows on a hedge. I had to manually focus but in good light I got some more than decent results. The thing I noticed most about this combination was that the focusing ring was awkward to adjust as it sits towards the heel of the hand as it is now close to the camera body. And as you have found, the lens foot is relatively small. I finished up using my thumb and little finger to do the focusing whilst the other fingers and my hand was pointing forwards to support the lens. I needed to do this as the lens fully extended with the 2x convertor in place makes for some considerable physical length. Obviously on a tripod this wouldn’t be an issue, and your tip of using a lens plate on the foot is something I am going to look into. Thanks again for your great reviews and your very informative blog. It was very good to actually meet in the field :-), and those were some fantastic sightings.. I probably need to spend a bit more time with the DO ii before making a direct comparison..
A great review Grant. Thank you. Seems like a big improvement on the old version, which I have, and use a lot. Glad that Canon have sorted out the wear and tear issues on the lens hood. And that it is now more dust proof without the push/pull mechanism. Will have to get my hands on the new model soon somehow. Really enjoyed your review of the Canon EF 100-400 L f4.5-5.6 IS ii USM which I have just acquired, having traded in the previous model. I look forward to reading your future reviews. Hi Dave, thanks for the feedback on the review. I will be working to expand the review section on the website as time permits, and I hope you find the new lens as exciting of an upgrade as I have. An excellent review as always. I did not use mine as mush as you did but is very happy with the results, for birds is flight the improved focus speed, focus accuracy and image sharpness is a real winner. The image quality is mush closer to my Canon 500 F4 MK1 compared to the old 100-400, as you indicated as well. I find the 70-200 F2.8 with a 2X converter not nearly as good as the 100-400 MKII especially when it comes to focus speed an accuracy. I am using the Canon 5DIII and 7DII currently. Also I am happy to hear that you are experiencing similar results with your 100-400Mk ii, always good to hear. 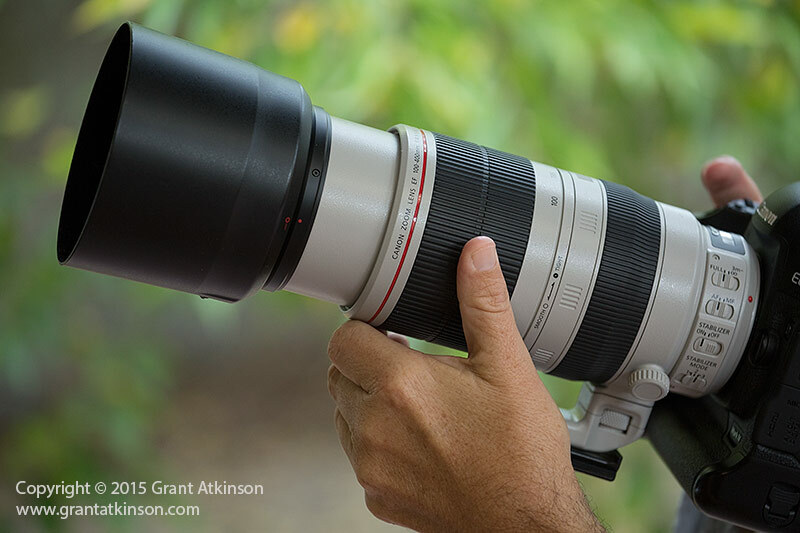 I agree with you that the new lens outperforms the 70-200 f1.8 plus 2x extender quite easily. I have been using mine with the same camera bodies as you have for most of my shooting so far. Thank you for the in-depth and field relevant review. Being in the same field as you, I’m always looking for better gear. I was a HUGE fan of the push pull zoom, but the image quality and AF was not up to scratch anymore with the previous model. In my opinion sadly, they did away with the push pull, as I was way faster in zooming than my clients, and dust was not a concern in my oppinion. I do not know if you ever had the opportunity to use the new Sigma 120-300 2.8 “S”. Though I find the optics superb the weight of the lens is a killer. The 100-400 mk ii had to be the ” good weather” alternative. Any thoughts in that line? 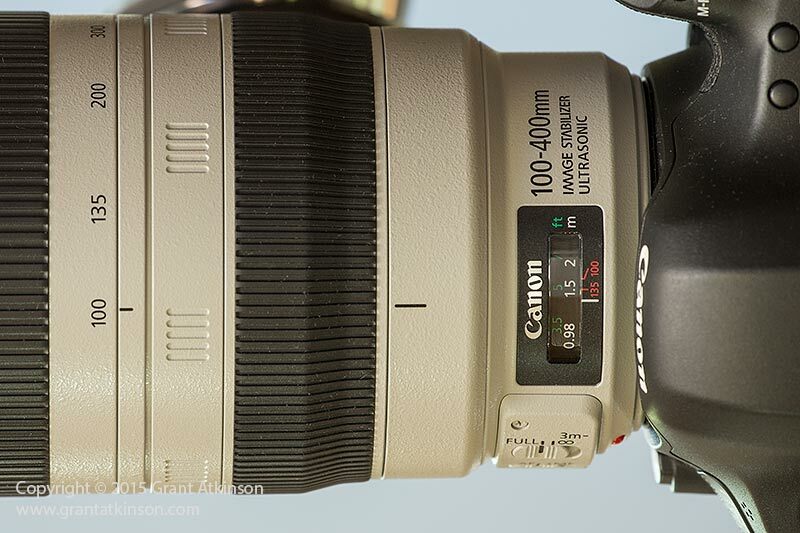 Your review was the first that made me look at the new 100-400 again! One again a big thank you for this review! Thanks for the feedback on the review. I have used the Sigma but not very much. I think you have made the correct assessment of a comparison between that lens and the EF 100-4-00L IS mk ii..in very low light the Sigma has an advantage..whereas in good light the Canon gives away very little. Sharpness is quite close between them. I think AF speed may be faster with the new Canon but that can be fine-tuned on the Sigma using the USB dock of course. Thanks for a great review. I also enjoy my 100-400mkii on a 7Dii body. As a bird photographer and proclaimed pixel peeper I must admit I find it even sharper than my 70-200 f2.8 IS ii, and on par with my 400 f5.6 on APC. However I’m curious how it will preform on FF against the 70-200 f2.8 IS ii, and weather I should look at the 1Dmkiv or the 5d3 for my next step up for birding. I would further value your advise in AF setup on th 7Dii for birds in flight or small static but erratic birds? Thanks for the feedback. I have been using the 100-400mk ii on my 5Dmk3 quite extensively, and it works very well, with very good autofocus accuracy, even in quite low light..surprizingly low, in fact. On the other hand, the finder pixel resolution of the 7Dmk2 makes that camera perhaps a better combination with the lens, if birding is your main priority. 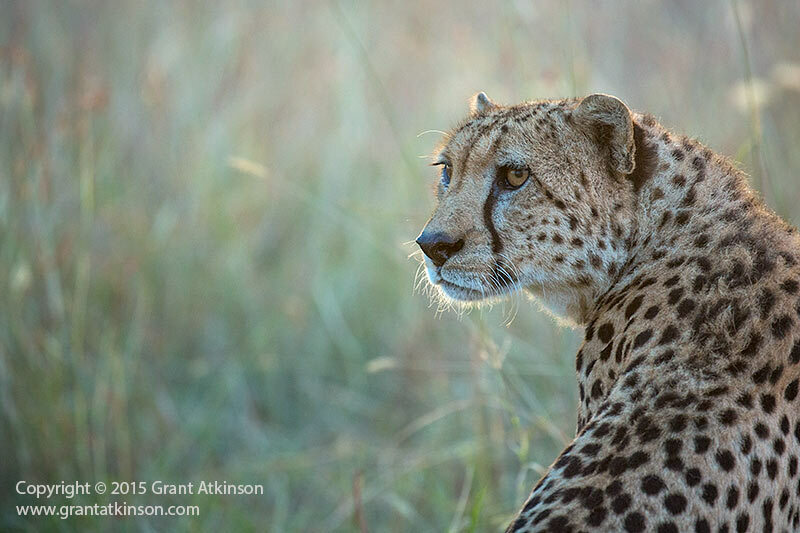 For mammal photography, the 5D3 pairs superbly with the new lens. I have chosen the 5Dmk3 over the 1Dmk4 (and have done a post dedicated to comparing those two cameras on this site). If you are having to crop heavily most of the time, then there is little to choose between the two cameras in image quality. If you dont crop too much, the 5Dmk3 has a significant image quality advantage. Your comments to Pieter were helpful to me as well. I am also using the 100 — 400 Mk II in combination with a 7DMkII. I have also been using a 1.4 tele-converter. I am struggling somewhat to get sharp focus with moving bird subjects. a case in point was photographing a juvenile Jackal Buzzard taking off from a fence-post yesterday. I was using a fast shutter speed 1/1000, f10 and high ISO and yet the pic of the JB taking off was not sharp. It seems I was not able to achieve autofocus, lock the focus and maintain the focus using AI Servo ‘rapid-fire’ sequence. Any suggestions as to what I may be doing incorrectly? Fine-tuning the AF can take the form of setting Ai Servo 1St Image to Focus Priority….although this might make the shutter release feel ‘spongy” and a little unresponsive if focus is not easily achieved. 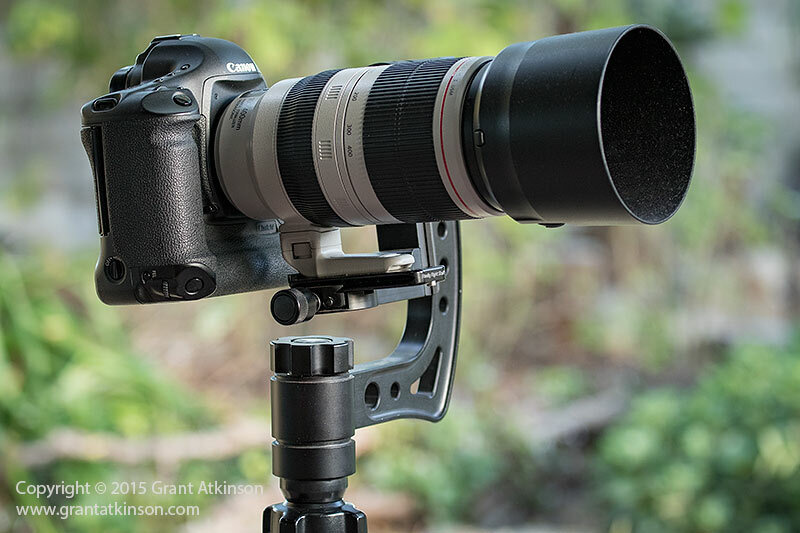 That is not how I set mine up, but I don’t often try to use it for bird photography with the 1.4x extender in place. Ai Servo tracking sensitivity might also be a parameter with a big influence. Most AF systems tend to struggle to track a bird taking off from a standing start…it is much easier usually to track a bird in level flight. If you are able to achieve that shutter speed, which is perhaps just enough, and f10, which is a lot of depth of field, it may be worth trying to focus on the bird from a stationery rest, and then switch off Autofocus so that it cannot get disrupted by that sudden jump-off when the bird takes flight. You could have enough depth of field to get the first few shots sharp, even if the bird is coming towards you…but for sure if it flies off parallel with you then temporarily locking or turning off AF could help. As far as reasons for your current difficulty, at f10, and at 560mm on a crop body, it sounds like you could be some distance away. Also bear in mind that over long distances, if there is a lot of heat haze/rising air, that can interfere with AF performance. I also dont do that well when the sun is overhead…if I can get the sun from a lower angle, shining on the side of the bird..then i expect to do better with AF. Hope that helps with some ideas. I would like to ask you question about lens budget. My question is – If I am really feel this upgrade on my picture ? The EF 100-400L f4.5-5.6 IS ii takes images that are sharper, even at 400mm and f5.6, and it focuses much faster and more accurately (despite the extra 100mm of focal length) than the EF 28-300L IS USM. I would consider it an upgrade in all respects, including better Image Stabilzation and durability. I have one more thing to get your help. Can work with 100-400mm when AF is selected ? So I can say with certainty that the 6D won’t be able to autofocus using the viewfinder, with the EF 100-400L f4.5-5.6 IS ii and EF 1.4x iii extender attached. AF doesn’t activate. I know that the 6D AF is very sensitive even in low light, especially the centre point, so I am guessing that the AF sensor itself would be able to work fine with the light from this combination but clearly Canon are not comfortable with allowing this function to take place. You can make use of Live View with this combination, but it drives quite slowly. Thanks for your articles, love reading them. Can’t say they make my life easier, gives me more options and make the decision process difficult. Very informative though. Decisions, decisions, a D7 MKII or a 100-400L MKII? Budget doesn’t allow both. Current situation – 5DMKIII, 7D, 550D. Lens wise – Tamron 150-600, Sigma 120-400, Canon 70-200L MKII 2.8. Main use – wildlife photography. Must be honest, I’m a bit of a techno freak and the 7DMKII makes me slobber. But is it really that much better than the original 7D and is the 100-400MKII really 24K better than the Tamron? Should the decision be the Canon 100-400 it will replace the Sigma and maybe even the Canon 70-200. One body less to tote around. If allowed only one body and one lens for wildlife photography what combination would you pick. Thanks for a great site, I just love visiting…. Maybe I shouldn’t buy anything and rather do a trip to the bush. Hi Nico, sorry for my late response, I am just back from the field. 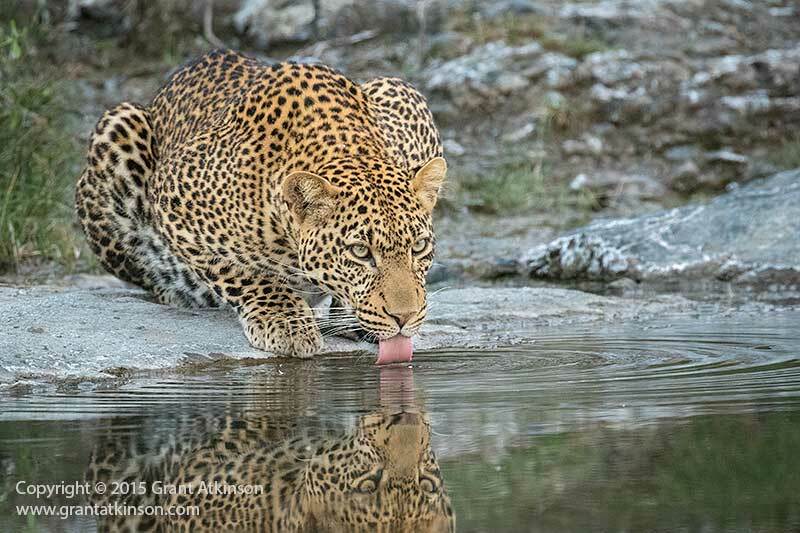 If I had to choose one body and one lens for the kind of African wildlife safaris I do frequently, with light weight and portability a positive weighting on my decision, I would choose the EF 100-400L mk ii and the 5Dmk3. Drawbacks to this would be that it is a bit short for smaller birds or those that are far away. Advantages are that the 5dmk3 can be used very comfortably at higher iso settings for mammal photography when the light may be low, which makes up somewhat for the moderate maximum aperture of f5.6 on the 100-400. With your list of gear above, i would tend to go for the 7Dmk2 first rather than another lens – as you already have the focal length of the Canon EF 100-400mk ii covered with the three lenses mentioned above. The 7Dmk2 will bring benefits to all your lenses. Replacing the Sigma 120-400 with the new Canon 100-400L mk2 would give better focus, superior images, better IS, more robust lens overall, and you might even find that for wildlife, you end up not using your 70-200 f2.8 so much. That has happened to me. I own both the 70-200 f2.8 and the new 100-400L ii but choose to take the new 100-400 over the 70-200 for about 80 percent of my safaris. I only choose the 70-200f2.8 over the 100-400ii if i expect to be working in very overcast conditions much of the time. In the UK, the price for the new 100-400 mkii, is roughly the same as for a second hand Canon 300mm 2.8 IS USM (not the current version). So I sold my old 100-400 a few months ago and I have more or less decided to go for the 300mm (I also have the 100mm IS macro and a 1.4mkiii extender with a 5D mkiii). My rationale for picking the 300mm is that it will give me a bit of flexibility in terms of light-gathering ability (much needed in this cloudy country – we are getting bad weather warnings in mid-August); and I can use the extender to get me to 420mm at f4. I’m also hoping for faster and accurate AF and much better IQ. Downsides: 2.5m minimum focusing distance, extra 1kg of weight and size. Sorry if this sounds like a letter to an agony aunt, but do you reckon I’m doing the right thing? I have loved the 300mm every time I have shot with it, but would the 100-400mkii do a good enough job? Sorry for my late response, I am just back from the field. I would agree with your thinking above, and go with your 300mm plus extender choice, given that it allows you something that any of the 100-400 lenses don’t, and that is the option of shooting at f2.8, bare. It also gets you to 420mm at an aperture advantage of f4, still a good low light set of numbers for tele shooting. Once you put the 1.4x extender in place, there will be little difference in image quality in terms of sharpness and AF speed between the 300 mk i and 1.4x ext, and the new EF 100-400L ii, at least not enough difference to be a differentiator. You have also identified the other downsides being the longer minimum focus distance and weight of the 300mm lens. That MFD would only be critical if you routinely need to work at closer distances – so how important it might be would depend on your intended subject matter and how big or approachable/shy it is? The 300 f2.8 mk i or ii remain incredible lenses. I am not sure what body you typically use but in good light the new 7Dmk2 also performs fantastically on the 300f2.8 IS and that can help you get extra fine resolution for added cropping depth? Hope all’s well. as you know I went off to the Kgalagadi recently and took almost my entire lens collection with me! 20mm F2.8, 24mm TSE, 24-105, 100mm F2.8 Macro, 100-400 Mk ii, 300mm F2.8, 500 F4, 300-800 Sigmonster. Taking 5,000 images my most used wide-angle 24-105, Best for night sky (stars as spots) a surprise with the 24 TSEii, my most used Tele – the 100-400 mkii, then the 500F4 followed by the 300-800 Siggy with the 300mm barely making it onto a body except at night. You are right the 100-400 mark ii is a very very fine lens. I thought I wouldn’t like the loss of the push-pull but it is far better (for me) without it. Image quality is superb. Almost superb enough to make me think of trading in some lenses for the 500 F4 mkii. I found it was excellent paired with the 7D2 and because it provides a similar reach to a full frame + 500 F4 I used it very often like this. It is a little short for small birds. The close-focus was also really useful. The next time I go on Safari driving myself I will only be taking the 24-105, 100-400 mkii and the 500 F4 (specifically for small birds or blurred backgrounds) and the Siggy because I love it 🙂 For larger wildlife and especially for fly-in safaris I would be very happy with the 100-400 alone. One important bonus was the ability to use my Landscape filters on the end. The 77mm thread on a long zoom is a real advantage for those creative shots or for shooting longer into the day. 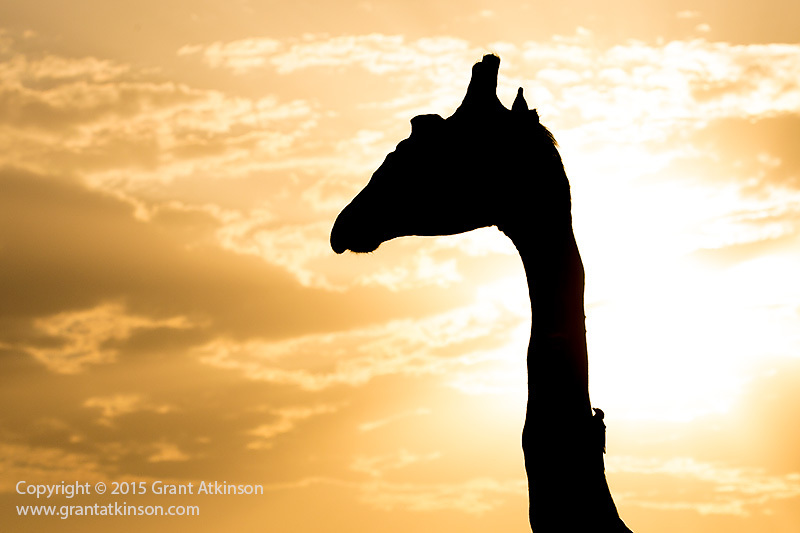 I really enjoyed using a 6 stop ND filter on a giraffe fight for shallow depth of field and blurred motion. Fun times! Thanks for the review and recommendation I am a happy camper. Thanks for the comprehensive review. Your comments on use in the field and hand held is what convinced me to upgrade in the end and I have not been disappointed. Thanks for the feedback and apologies for my late response, i have been away. I’ve gone out and purchased the 100-400 ii to pair with my 7D mark ii, and I’m unsure whether or not I should get myself a 1.4x extender. I know that it’ll limit me to center point AF at f8, but I’m worried that it’s going to slow down the AF too much. I’m also worried that it’s going to require a MFA, which I’ve never done before. If i’m not mistaken, the necessary amount of MFA can change at different zoom lengths, and that might render it perfectly focused at 560mm, but not at 160mm. Perhaps you can shed more light on this subject? Will the camera remember the MFA settings for the 100-400 ii with/without the 1.4x, or do you need to adjust it every time you add/remove the extender? 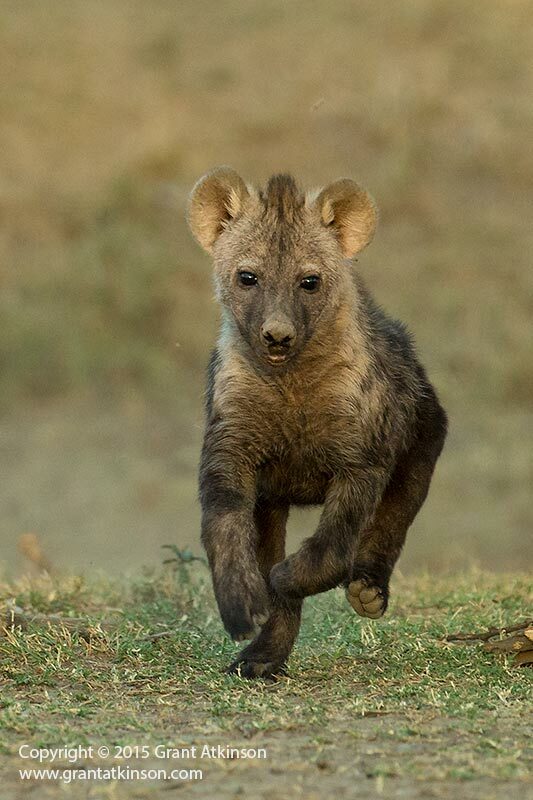 I mostly shoot wildlife and BIF in the Kruger. As you can’t go off road in the KNP, I can always do with more reach! I understand that the slower AF might make capturing small BIF difficult, but as I do not own this combo, I have no idea how much slower it’s going to be. Being limited to center point expanded won’t be a problem as it’s what I tend to shoot with anyway! I often find that with BIF I like to use F8 to give me a bigger DOF, so that isn’t terribly limiting either. Most of my shots in Kruger are taken in lower light (early morning/late afternoon) so obviously the 1.4x won’t be too good for those shots. Basically, would you have an extender with this setup, or use the lens bare for the faster AF, and crop extra when necessary? Lastly, how big of a difference is there between the 1.4x ii and iii? 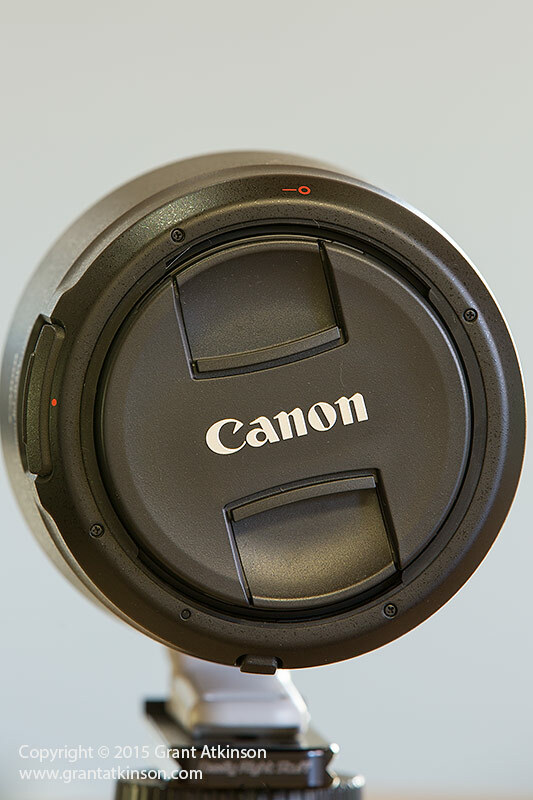 The 1.4x ii can be picked up second hand for +-R2500 whereas the iii is too difficult to find used (R5500 new). With regard to the 1.4x extender and the 100-400 mk ii, I can share what I know which may help answer some of your questions. At the same time, I have not used the new lens with the 1.4x version ii extender, so i cannot compare how that works against the newest extender. I do think though that the 1.4 version ii will perform decently well with the 100-400 mk ii. With the 7Dmk2, I found AF to remain surprizingly fast, but a bit limiting for birds in flight kind of speeds. In my hands, I would not be confident of getting sharp flight shots of fast-moving species like ducks, bee-eaters or similar, with the extender in place. However, with bigger, slower birds, like herons, storks, pelicans for example, my feeling is that it would be possible to keep the extender on and get good results. I would also only use the extender in bright light. For perched birds the extender is pretty useful, in that it can get you more detail and a bigger subject size. You can perform MFA adjustments on the 7dmk2 and the lens, as well as the extender and it will remember that lens and extender and focal length settings and revert to them each time you combine them. You wont need to redo the adjustments. I have not felt the need to perform any MFA adjustments on my 100-400L mk ii. On the 7Dmk2 you can set in two MFA settings for each particular lens/extender combo – one for the wide end and one for the long end. Thanks for the review. Used the 100 – 400 and 7D II in the Pantanal in August and was amazed at the quality of this lens. It covers everything I need for my use in all situations.. Your images are proof of what can be done with this equipment. Also good to hear that the lens is doing the job for you, as my 100-400Mkii is still impressing me, after 9 months of hard use. Great review, reads like a thesis from one of my students! I will be visiting Namibia/Botswana in two weeks time with my wife and daughter(she is flying over from Rio where she works for the Olympics). Julie uses her Canon with a couple of good lenses but only up to 100mm. She would love the new 100-400 but the price in Rio is astronomical! So, I would like to see if I can get one in SA or Namibia for her. Which would be a good place to order and pay online? To get the lens in Windhoek or Swakop will be sheer luck, but will be much more expensive than in South Africa. In Cape Town are a few dealers who might have the lens, most likely Orms and Cameraland. In Johannesburg would Outdoor photo and Camer@land be my choice. As a matter of fact I know the lens is not available at the only “Photoshop” CAPI on either Airport in Cape Town nor in JHB. Maybe a phone-call to any of the stores in advance might help. If you still have your old 100-400, is it possible to post side by side images of your test subject taken by 100-400 and 100-400 MkII at 400 mm? I am still trying to figure out if 100-400 MkII at 400 mm is any sharper (at the center of the frame) than its old version. Hi Grant, I am planning to buy a new camera body, would the Canon 70D fit well with the new 100-400 mm lens ? I read in a review pictures would not be very sharp at the maximum length. I am thinking of buying a new camera body. Would the Canon 70 D together with the 100-400 mm lens tested above be a good combination ? I read in a review pictures would not be sharp at 400 mm, not sure if it is true. As always a great review..
Why would you prefer to carry the 100-400, rather than the 70-200 II with a 2 X converter, which effectively gives you 140-400 f4 when you want it, allows better low light shots, and has, I would submit, better optics? Grant I recently went to Kruger and test the 100-400 II in all sorts of situations on a 5DIII and 7DII body and I must confirm that the lens really gave excellent images of static and action shots. The focus is very fast and the IS works very well. I shot in late afternoon low light as well as birds is flight . The copy a have is definitely much sharper that the MK1 I had and I do not hesitate shooting it full open at F5.6. Had 7d 2 for a year now and 100-400 2 for a few months and they are a fantastic combo. Sold my 300 f4 prime finally as the zoom was optically as good and ran rings around the prime on performance. Hi Ken, I was able to shoot the 100-400mk2 alongside the EF 300L F4 IS, on the same camera bodies, and then compare the results, and the 100-400 mk2 clearly outperforms that older 300 in anything except the brightest light. I found focus to be faster, and more accurate, and just more consistent. Thanks for sharing your finding too, and i am in total agreement with you on the results. My own 100-400ii has now had well over a year of hard wildlife use and it just continues to impress me. I have found it to be surprizingly usable with the 1.4x converter, in good light. Thanx very much for the review! I have a dilema, so maybe you can help me solve it…..
100-400 L IS II USM .And if i will buy it, should i keep the 70-300 or not. What do u think? Is their a point to keep both lenses? The second thing is the weight. Is it comfertable to take pics for hours with the 100-400 without a tripod? Thanks for a great answer, DaveT, and pretty much what I would say too. We still own our EF 70-300L IS but almost all the time prefer to use the EF 100-400L IS ii in preference. The EF 70-300L IS does offer a significant weight advantage, which can be important if you are trying to meet airline baggage restrictions. The EF 70-300L IS is also more compact when retracted by a long way ,so much so that it can fit vertically into a small compartment in my camera bag, whereas the retracted EF 100-400ii has to lie flat, taking up more than twice the space in the bag. The EF 70-300L IS is also lightweight enough that handholding it is almost effortless, so much so that I will sometimes use it with one hand only, and Live View on DPAF bodies like the 7d2 or 70D for ultra low angles when I cannot get out of a vehicle. The EF 100-400ii is much too heavy for me to use one handed, though handholding it is easy enough for me, even for long periods. Those the are main times that the 70-300L is preferred over the EF 100-400, for me. My wife and I both shoot, so we have kept our EF 70-300L IS for those times when we both need zoom lenses at the same time. Thanx a lot to you and to Dave for your answers!! Problem is soved thanx to both of you! I can’t answer for Grant, but I can offer a point of view based on my experience of having both these lenses in my kit bag. Firstly I would say in relation to owning and keeping both lenses it’s very much a question of personal need. The 70-300 mm packs much easier in a smaller kit bag and is a good lens for travel where weight and compactness can make a difference. Optically its a good lens too that I am sure you have found out for yourself. I confess that I haven’t used mine very much at all since acquiring the 100-400 (thirteen months ago). The second hand/ trade in value has also dropped since the introduction of the 100-400 Mk II so that is another consideration. I have kept mine also because my wife uses it as she finds it easier to handle than the new 100-400. In short the 100-400 is in my opinion better for my own needs, and is immensely versatile, and in many ways makes the 70-300 superfluous but for the moment, I can justify hanging on to my 70-300 as well. As for using the 100-400 hand held for a number of hours, again that depends on you. I carry mine hand held for many hours at a time with no problem at all. It isn’t a small lens though, but then again I am fairly used to carrying heavier lenses for periods of time while walking around doing wildlife photography. I tend to carry it with a neck strap around my neck but carry the lens in a cradle fashion using both hands across my body. I also sometimes carry it in a larger Lowepro shoulder bag and take it out as necessary, very much as a conventional camera with shorter lens. I would say that it’s very much down to what you are comfortable with. But in short -yes, the lens can be used hand held for many many hours with no problem. I hope Grant doesn’t mind my offering you these points of view Moshe , and I hope it at least adds another perspective to help you in your decision making. I appreciate that I’m coming to the discussion rather late in the day but I’m delighted that I came across your fantastic review at this time. I’m off to Kwhai, Savuti and Chobe later in the year and I’m agonising over the combination of bodies/lenses to take with. It would be easy one’s budget was unlimited, wouldn’t it? – Which would you suggest, the 300 and 1.4x or the 500? – In the field, which lens would you pair with the 5D and 7D respectively, so that I’m ‘ready for action’? If you are taking the 100-400 mk2 with you, then for sure I would take the 500 f4 on rental, that way the rented lens gives you an added 100mm of reach, a maximum f-stop advantage of f4 over f5.6 for when light is low, and also has the capability of blurring the background more. Even though you might get very close to your subjects at times, there will be other times when the added reach of the 500 is invaluable, and for birds it works great. In the field, I would decide which camera to have on the 100-400ii or the rented 500f4 by taking into account which lens i was using the most at that particular time or place. When talking about the original 7D and the 5Dm3, I would always prefer to be using the 5Dmk3 as my primary camera. I would also take into account the full-frame sensor camera being better at high iso, which can come it more often when using the max aperture f5.6 lens like the EF 100-400ii, and I would also look at ambient light. The brighter the light gets the more that helps the 7D image quality. I very much appreciated your prompt and detailed response – it all makes perfect sense. May I ask one supplementary question? My preferred rental source is saying that the 500 may not be available. If so, would you opt for a 400 f2.8 II or the 600 f4 given your earlier comments? Both the 400 f2.8 ii and 600 f4 ii are significantly larger and more bulky than the 500 f4 ii. That can make managing them a bit more difficult, depending on your vehicle configuration, number of other folk in the jeep, etc. That said, the 600 f4ii will add significant reach to your setup, plus great power for blurring backgrounds at the cost of manageability and having a narrow field of view. The 400 f2.8 is only going to give you background blur. Thanks for a great review and so helpful on making my decision to purchase the 100-400 MK2 cannot wait to pick it up in two weeks time! Hoping to use it at Formula 1 this year. Great review. My question concerns the image quality comparison between the new 100-400 II and the 300 f2.8 II. I am looking for the highest image quality. I would appreciate if you would share your opinion. In my opinion the images produced by the EF 300L f2.8 IS ii are the best that i work with (along with the 400f2.8, the 500f4 and 600f4, and even the older Version 1 fixed super teles). They have the best fine details, a higher level of local contrast, and somehow, even when the ambient light may be far from ideal, they seem to produce surprizingly good images. On the other hand the EF 100-400L f4.5-5.6 IS ii gives me images that are very good in their total quality, and easily good enough for my requirements, whether they be large prints, or magazine use, or deep cropping for distant subjects that may only be used on the web or screen. Thank you for taking the time to answer my question about the image quality comparison. It will help me with my decision as to which lens to buy. I have been spoiled by the 500 f4 II and desire to buy only lenses that give that level of performance. The problem with my plan is the loss of versitility of the zoom. I had the old 100-400 but it’s performance was well below the 500. I need to decide which is more advantageous. Great image quality and low light performance or really good image quality, adequate low light performance and great versatility. I am using the 5ds r and am finding that the detail is great but the noise level is also elevated compared to my 5d mkiii. To help with this I need good light gathering capability. The lens I buy will be filling the gap between my 24-105 and the 500. It will be used for wildlife too close for the 500. Your experience with both lenses and you willingness to share your knowledge is greatly appreciated. You can be sure that the new 100-400ii will deliver superior image quality to the original EF 100-400L, quite a bit better, and especially so if you are pairing it with newer Canon bodies like the 5Dmk3 and 5DSR, and are able to take maximum advantage of the better AF accuracy and its benefits. I am sure that you will also have taken into account the effect of cropping on image quality, and in this regard, the 100-400 holds a significant advantage over the fixed 300, at least any time you are shooting at focal lengths beyond 300mm. With my own zoom lens use, I always enjoy those times when I can frame is close as possible to my final output image, and use all the pixels, which limits quality loss especially at high iso. Maybe try renting one of the new 100-400ii lenses for an outing. I too use an EF 500L f4 IS ii for my long telephoto work but have chosen to pair it with the new 100-400ii as that combination fits my needs very well. We are traveling for 1 month to Botswana, Kigali (gorilla’s & monkey’s), Tanzania, and Masi Mara. I am a novice photographer that travels a lot. My photos are primarily for photo albums (max 8.5″x11″). I own a 600D and EFS 18-135, which has been fine for general travel. I am thinking Kigali may have low light conditions, and the rest of the trip needs longer focal lengths. I am trying to keep the weight down. Do you think a EF 70-200 f/2.8L II USM + 1.4 or 2x extender would be a better combination than the EF100-400mm f/4.5-5.6L IS II USM for that body? Or should I buy a new body and the later lens? If so what body? 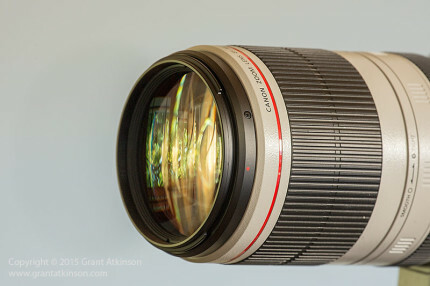 What’s the likely-hood I would be happy with Canon EF 70-300mm f/4-5.6 IS USM for the 600D body. If we bought a second camera that was use less (by her) then what would you recommend? Your plan of a 70-2–f2.8 IS ii plus a 1.4 or 2x extender is perhaps the most versatile – you will be able to shoot the lens bare for the forest work, and then attach the extender for the more open environments. I think you will find that if you get a 2x extender, that the autofocus will become quite slow and prone to hunt a bit on the 600D, although you will have 400mm at f5.6 with IS. I would look at it this way? 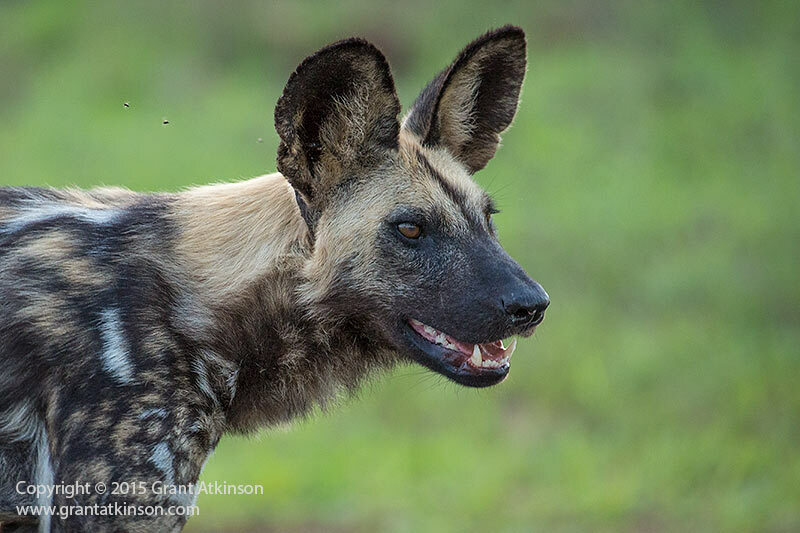 The 100-400L f4.5-5.6 IS ii outperforms the EF 70-300L in everything really, and would be the single most versatile lens you could get, that would do an excellent job in Botswana, and TZN, and the Mara. It also focuses faster and more accurately than any other Canon zoom lens and 1.4x extender combination, and much more so than the 2x extender. The 2x extender also makes the 70-200f2.8 very long and heavy. The only time the 70-200 would outperform the 100-400ii on your trip would be the forest portion. 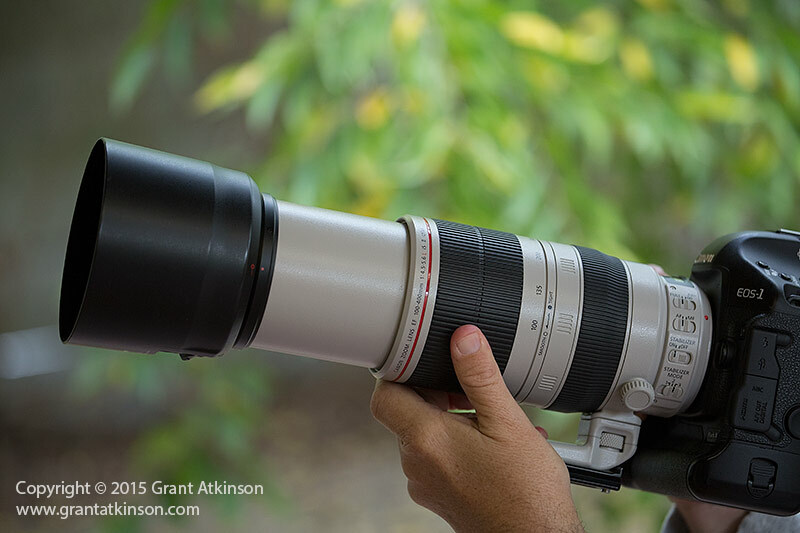 So unless the gorilla images are the main reason you are going, i would go for a 100-400ii. Then, if you can, perhaps get an 80D to put on it. That will give you at least a stop of improvement in low light shooting plus better autofocus all around, and with not much of a weight increase? By all accounts the 80D performs very well on the 100-400ii. If you still need a second body then 70D bodies are going at very low prices these days and it would share batteries, charger, cards and shooting experience with an 80D. That would be my approach? Thanks for an excellent, no-fuss review which doubles as a “how-to” guide. your review and comments are amazingly helpful, they are the best I have found on the internet, at least to help me decide wether I should buy the Canon 100-400 mark ii. I own a 70-300L, a 400 5.6 L and was planning to get the 100-400 mark ii, selling the previous 2, as you and everyone suggests that the 100-400 ii literally eats the former 2 lenses, and I know it´s true and I find the 70-300 too short, plus by selling these two lenses I can hopefully save space on my gear backpack. The problem? I am considering to sell the Canon 400 5.6L and get a used Canon 300 2.8 L IS (not the ii version) with a 1.4 extender, which costs almost the same as a new 100-400 ii. I own a 7d mark ii and this combo gets me even further than a Canon 400 5.6L , I believe with similar IQ and should I need a zoom lens, I can still keep the 70-300. So in your opinion, what is best: to get a 300 2.8 IS mark 1 or the 100-400 ii? And is a x2 Teleconverter a good combination , or will it take a considerable hit in IQ? I went recently to the Faren Islands in the UK, which is a paradise for bird photographers in Europe, and the 2 people that took best bird photos was a guy with a 100-400 lens and me with my 400 5.6 prime lens. Thanks for your question, which is a tough one. I have no doubt that the new 100-400ii will easily beat the combination of 70-300L plus fixed 400L 5.6 in the field – it is more versatile in one lens, it is just as sharp at 400 f5.6 as the fixed lens, and it gets many more sharp shots when handholding because of its excellent IS. Add in close-focus, and you have a tough act to beat this lens for its size, weight and cost. But you post a very hard question, as to whether the combination of 300L f2.8 IS (which i owned as my main wildlife lens for many years) and the 1.4x extender would be better. I think it probably would be – i found that i used to get very good sharpness by stopping down the 300 IS f2.8 with 1.4x version 2, to f5.6. I could still shoot at f4 though sharpness suffered a little. Still, in this regard it adds 20mm of focal length advantage as well as an f-stop, over the 100-400ii. It will be less versatile if your subjects come close or you have to change framing rapidly, but you will manage that best you can by working with a second lens, the very good EF 70-300L IS. Plus, you still have the option of removing the converter if subjects are close with the 300 f2.8 and having the full advantage of f2.8 action stopping AF performance. Working with the 300 f2.8, specially if you have a converter fitted, will require a bit more input from you – it is a quite a bit heavier, and more cumbersome to manage when handholding, but nothing too difficult. But if you spend lots of time slithering around on your belly or over rocks and gullies etc the manageability difference might play a role for you? For sure both of the new 100-400 ii or the 300f2.8 IS ii with a 1.4x extender will boost your capability for capturing great shots. I prefer to not really use a 2x extender with the 7D Mark 2 myself. I would use it with no worries for static subjects in good light. But i do prefer the 1.4x converter for the crop body. Hope something there helps make it easier? I am returning to your excellent review and discussion thread, having now acquired both a 100-400 Mk 2 lens and a 5D Mk 3 in anticipation of photographic safari in Botswana in three months time. 2) Is there a particular technique you use to quickly select a single AF point given that one so often needs to respond to unfolding events (your moving lion is a case in point)? Do you have a preferred default single AF point? 3) Is Ai Servo your default setting for Auto focus? Finally, are you able to recommend a budget lens plate suitable for the 100-400 lens? 1) The inner core of focus points for me means any of the AF points except for the outermost perimeter points – just coming one row in seems to work perfectly. If something is going to be moving ultra-fast, and it is quite small in the frame, then i will just use the centre point. 2) To switch between the focus groupings, Single Pt and AF Area (1 plus 4), I just press the M.Fn button next to the shutter, with my index finger, after once pressing the AF button (with the square grid emblem on it) on the far back right of the camera first (with my right thumb). I dont have to look away to do this. I also remove any of the focus point groupings that i never use, from the list available, that way scrolling is limited to two or three. That helps with speed of selecting the new grouping/pt configuration. 3) I am always in Ai Servo when in the outdoors. I think Gimpro (Ralph Pollack) in Centurion makes generic lens plates that ought to work and his prices are good, and workmanship exceptional. I have also seen decent ones from Benro. In case I am slow to respond in the days ahead, it is because i am in the field. I have been fortunate enough to enjoy your photos for years, and at 64 years of age, I run into three of the most beautiful shots I have ever seen, on a lens review of all places. I am leaving in the French Alps, and currently use a combo made of a 5D mkIII and a 7D mkII, with the marvelous EF 300 f2.8L IS mkII, both extenders (1.4x & 2x) mkIII, and also the EF 70-200 f2.8L IS mkII. I mainly try toncatch wildlife. I was expecting being able not to lust after the new 100-400 by using the 70-200 with the EF2x when I want to hike “light”, but I am not really happy with the AF speed, nor I am with the IQ of this combo when shooting longer distances than 30-40 m.
I anyway like my 70-200 very much for portraiture when used wide opened, or for landscape. Although I am pretty convinced the new 100-400 will perform the same as the 70-200 for landscape despite its narrower field of view, I am doubtful about its use for portrait. Here is my first question : shall I keep both zooms, or can I rely on the 100-400 for a polyvalent usage mixing wildlife, landscape, portraiture (and proxy thanks to the small minimum focus distance) ? And here is another question : am I right to consider that the 100-400 would not be a competitor of the 300 prime but rather an ideal complement ? I indeed envision a doublet made of the 5D mkIII + 100-400 mkII (w or w/o 1.4x) and the 7D mkII + naked 300, or another doublet made of the 5D mkIII + 300 (w or w/o 2x) and the 7D mkII + 100-400 (w or w/o 1.4x). And when I want a light kit, just one body with the 100-400 and both extenders. 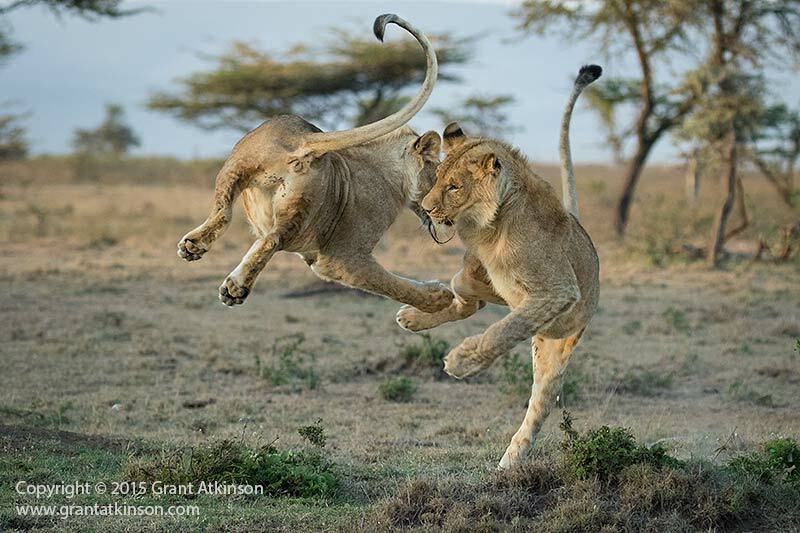 Hi Grant, very good review of the new Canon 100-400mm l lens, thanks. I currently own the Tamron 150-600mm which I am very please with, using it with 5D MK 2. I am taking a post in Tanzania and whilst there intend to safari whilst there. I have considered a 7D Mk 2 plus canon 100-400mm simply because of the weather seals on both, and after reading your review this set up could provide nearly or as good IQ as my 5D/Tamron set up. What Are your thoughts. That would be in interesting comparison …you would be giving up a true 600mm of focal lenght, along with the larger size of your full frame 35mm sensor but on the other hand you would gain one stop of light gathering from the 100-400ii lens, along with a newer sensor, albeit it of APS-C size, when comparing the 7DMark 2 with the 5d2. I have not shot those two combinations side by side, but I would guess that the 600mm full frame rig would hold an advantage of sheer resolution for really distant subjects. On the other hand, I think you would get significantly faster, more accurate autofocus results, specially noticeable with moving subject matter, when using the 7d2 and 100-400ii, compared to the older camera and Tamron lens. The 7D Mark 2 is way ahead of the 5D Mark 2 in anything to do with wildlife photography except perhaps pure image quality. Autofocus, buffer, response, ease of use, customizing ability, ergonomics, viewfinder are all way better. I also think that with the lighter, newer combination, you would have an outfit that would be easier to handhold and manage when it came to tracking, etc and deploying quickly. Minimum focus distance advantage to the 100-400ii as well as latest generation image stabilization. You can also add a 1.4x extender to the 7D2 and 100-400ii combination for use for really distant subjects, it does drop the aperture to f8 but can provide decent results in good light. There has to be one in the crowd, and I am saddened to say that I am not getting the focus I expected with this lens. I am using a D70 and the focus just is not there. My othet lens that came with kit focuses great. Sorry to hear that William, unfortunately, without actually being able to see your lens or the results it produces, in hand, it can be difficult to try and figure out why it is not meeting your expectations. 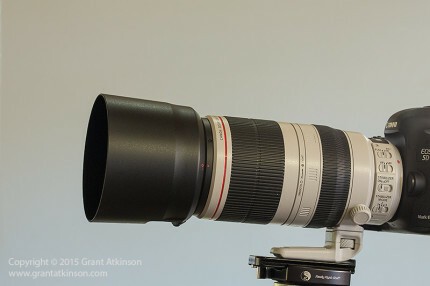 I’m going to the Tetons and Yellowstone but am hoping this lens will work well for landscape shots as well as wildlife. I’m a bit of a novice and am looking to rent the lens. Thanks for any help. I think that the 100-400 makes for a pretty good landscape lens – there is a bit of vignetting that happens if you are at f5.6, visible on a full frame camera, but stopping down a couple of stops clears it up quite efficiently. Otherwise the lens is sharp enough, and provides great contrast and colour. It also provides lots of flexibility with its wide zoom range. Image stabilization system in the lens is as good as IS gets, but if you are shooting in the lowest of light, for landscapes, then a tripod will be a good investment. Thanks so much Grant. I have a Canon 3Ti and I do have a tripod but haven’t played with it much. Should get the lens before the trip to test it out. Thanks again. I just want to say that I was in Kgalagadi in June and used the 1.4 MKIII extender with my 100-400 MK II lens and I am very satisfied with the results! I don’t know why but on the camera screen the results did not look so sharp….but back at home and on my pc I was really very pleased. Hi Deon, thanks for that feedback. Sometimes I think that it can be a little difficult to judge critical sharpness on the rear lcd screens, especially as the camera sensors steadily increase in resolution. Much more important though is what you found when you got home, that the images were sharp. I too have been surprized by the quality that the 100-400ii and 1.4x iii extender delivers..much better than I ever expected. Thanks so much for sharing your real world experience! Hi Grant, I found you recently after searching for info about my new purchase of a used 1dx. I think your reviews are also the best ive found. Coming from someone that actually uses them for your living gives you and then us insights that most other reviewers simply dont have. The depths you go into really do help in forming a decision to spend what is for us mere mortals, a great deal of money, so thank you for that aswell. Please carry on doing what you are doing. All the best to you, Mark. Great review by the way. I will be visiting Costa Rica in September. I will take my 600II with me, but I also need a shorter tele. So, for me is the question 300 2.8II or the 100-400 II. What would be your advice? Body will be 1DxIIs and 5D3. 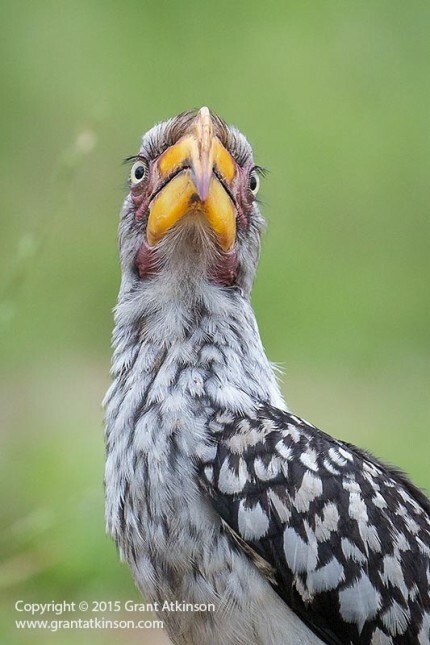 I would like to know if the pictures of the birds and animals were cropped. If so, by how much. I have had the canon 100-400ii for close on 2 weeks and have been very disappointed with the quality of the photos – they are just not sharp – in focus but soft and the quality is obviously worse when I crop the photo. I have a Canon 6D. I have now watched all your 7D Mk ii videos and have set up my cameras (incl. my 5D Mk iii) accordingly. 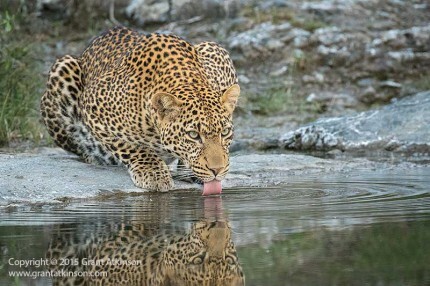 I am almost ready now for my Botswana trip in September. I have a question relating to the use of AI Servo focus mode when using a 100-400 Mk ii. 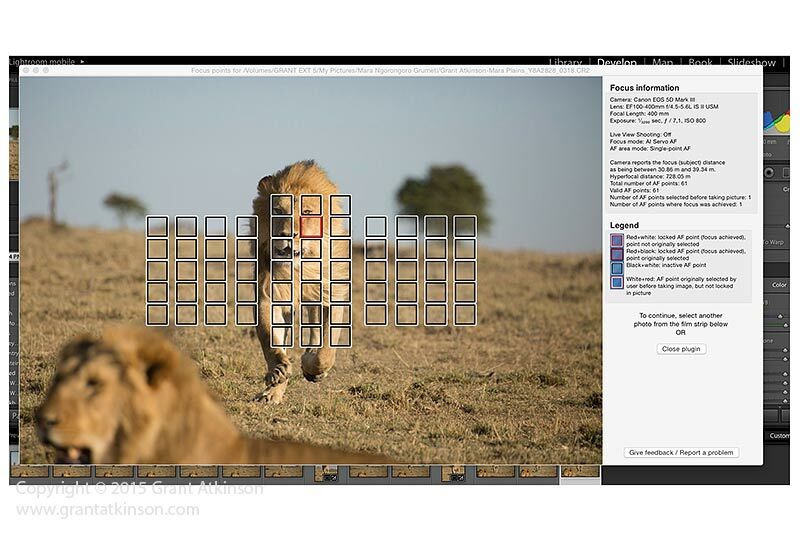 If you are tracking a moving animal, how is the auto focus affected if you zoom in/out during your sequence of shots? Hi Ronnie, if you zoom in our out, you might find that the subject goes out of focus momentarily…but so long as you maintain the position of the AF point over the subject, the camera will re-aquire focus very rapidly if you keep half-pressing the shutter (shutter-button focus) or keep the AF-On button depressed (back-button focus). Great review articles, thanks for effort to help others. I’m planning a trip to Massi Mara next winter for my family of five and have a carry-on concern for weights. Your review has helped convince we to upgrade to this lens. I currently have the following: 7Dmkii(2 of them),6D, 400f2.8 mki, 100-400 mki, 24-104L, 100f2.8L, 1.4xmkiii, 1.4xmki, 2xmki extenders. I find myself not using the 400 f2.8 much due to it’s size and weight. With it weighing 12 pounds, it’s almost a no go for airline travel with 26 pound carry on limits. I’m considering selling the 400, 100-400 and the 24-104 and replacing them with a 16-35f2.8LIS, 70-200f2.8LIS mkii and the 100-400mkii lens. 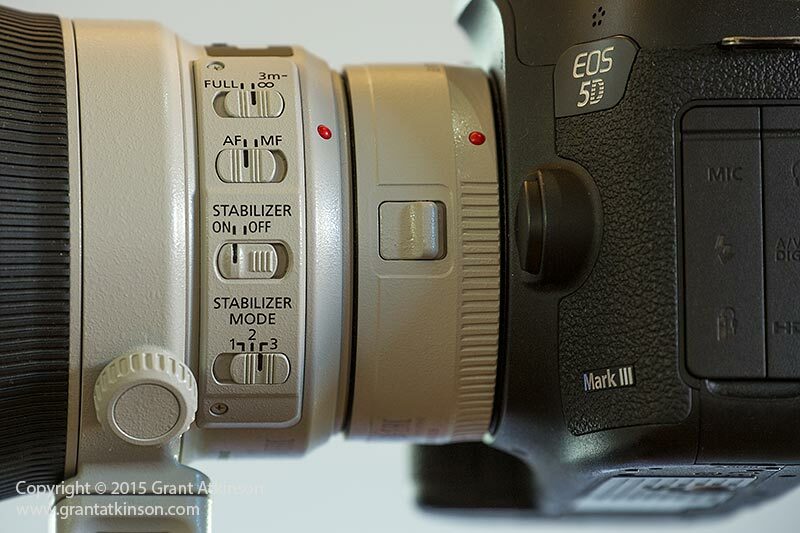 My thoughts are the 6D/16-35 are my landscape unit, and the 7Dmkii/100-400 and 7Dmkii/70-200 are the game units. Do you think that having the 400f2.8 there would be worth the trouble to get it there? Or would it be too big and cumbersome to be a benefit? I use it occasionally around home with a better Beamer for bird photos and with extenders to see goats on the mountains etc, but can do the same thing with the 100-400 as well. Of the lenses I have or could have what would you recommend for the trip to stay light and yet not have regrets once there ? Apologies for my late response, i am writing from a trip away. I think your plan of replacing the 400f2.8 with a new 100-400 IS ii is a good one, in terms of a trip to the Mara. Whilst the 400 f2.8 does have advantages, especially at the beginning and end of each day, you could counter that maximum f stop of f5.6 somewhat by putting your 6D onto the 100-400 at dawn or dusk for better high iso performance, at least until ambient light levels rise. Having the 70-200 f2.8 would also help at dawn and dusk, if the subjects were close enough or big enough for the lower magnification lens. Having the f2.8 option, or an f4 max aperture lens option, can be an advantage if you are mainly using crop sensor bodies like the 7D Mk2, as those lenses let in more light, which most benefits the crop sensor cameras. I might think of keeping the 24-105 or taking it along instead of the 70-200 or as well as, because the 16-35 only comes off at its best with wildlife if you have very, very close proximity to large sized mammals (like a few metres) and also if you have clouds in the sky, to expand your composition choices. I would also throw the 400DO f4, either of the two versions, or as a rental, into the mix of things to consider, as that lens is light, and takes a 1.4x extender quite well, which gives you 560mm at f5.6, as well as the ability to shoot at f4 and 400mm when that suited the scene better. Most of the time 400mm is enough magnification, but not always. Do you have any news about Canon 200-600? Sorry, no news, though i wish I knew 🙂 something. That would be a fantastic lens for us bird photographers! 70D can do AF with 100-400 IS 2 with 1.4TC? Hi Arindam, I dont think the 70D can focus through the viewfinder with that lens and extender but it can focus using Live View with its DPAF autofocus. Tell me Grant does not know photography, and I will tell you the Highland’s of Scotland are owned by an Englishman. Absolutely love your work. I have watched almost all your YouTube videos. I have an 80D, and just purchased this lense. 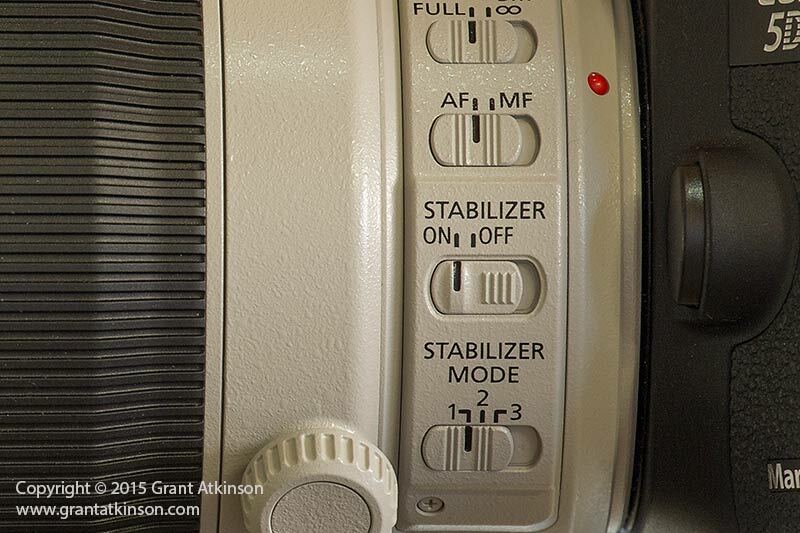 Would you be able to explain using real-life examples, the purpose of the 3 different stabilizer modes? Many thanks for writing such excellent reviews and instructional videos. I have recently upgraded my camera from a Canon 70D to the Canon 5D mk iv. Your video tutorial of setting up the very complex AF system helped me immensely. This old brain of mine takes a while to comprehend the instruction manual. I also use the 100-400 ii USM on the 5D mk iv as I did previously on the 70D. Have you done any updated reviews and findings with this combo? Do you have any tips and advice that you could share as I too am a wildlife photographer. Keep up your good work and hope to meet up one day. I also use the EF 100-400 IS ii on my 5Dmk4, and I found that the superior AF accuracy and extra sensitive autofocus in that camera gives me excellent results in terms of properly focused images. This is even more noticeable when shooting in very low light, such as that found after sunset and right around dawn. The combination also works very well on overcast days. Where I also enjoy improvement, is the superior image quality that is delivered by the 5Dmk4, as I am finding that I can easily use mine right up to iso 6400 for print. This helps a lot in terms of me managing fast enough shutter speeds in low light even when using the relatively moderate light-gathering capability of the EF 100-400L IS ii with its maximum f5.6 aperture. This means that I can enjoy the lighter weight, added portability and easy handling of the f5.6 lens without losing out too much when ambient light gets low.. I am currently working on more 5Dmk4 web and video output. Grant thank you for the excellent training videos. I agree that the 5DIV have excellent focus capabilities with this lens and all other lenses I tried it with. I upgraded from a 7DII to the 5DIV and is very happy with my choice. Hi Grant, thanks for this very good review, other equipment reviews and your video contributions. I am do photography as a hobby and not professional but have sold some prints recently, sign of thing to come? Like any photographer I am rethinking my gear and hope you can help? I am so busy analysing options that I am busy confusing myself… the 100-400mm reviewed here is part of the thought process. I also have unlimited access to a EF 600 f4 II courtesy of a very lenient brother in law. The two body option in 1 is a nice to have but my feeling was that for extended trips (Kgalagadi and Kruger) hire a 6D for the period if I go for option 2. The 1 body setup in option 2 gives newer generation Camera but the hassle of lens changes, is it worth it? The 70-200 lens has served me very well since i started up in 2007 and has excellent image quality, I would not like to compromise on image quality and the question is, will the 100-400 give me the equivalent? The 7D MkII is an excellent camera in good light with excellent auto-focus, I would like a better low light body with good enough auto-focus. Trust you can help out a confused fellow photographer, while the answer might not be clear cut even a gut feel will give me some direction. Sounds like some very carefully thought out planning that you have done there. I would go for the option that sees you buying the 5Dmk4 along with the new 100-400 IS ii, just as long as you can manage to hire a 6D for longer trips. Having to change lenses in the field can be quite a bother otherwise and it sometimes can mean you miss shots, get dust into your cameras and lenses and also place extra wear and tear on the lens/body mounts. The positives of having the 5Dmk4 though are strong, in that it is higher resolution than any of your current bodies and will extend your ability to shoot at higher iso settings. I find our 5Dmk4 can be used about a stop higher than our 5Dmk3 in low light or even a little more. It can also focus in lower light than any of the other bodies you mentioned. It is a very strong all round camera and with all of Canon’s modern features. The 5D Mk 4 is also closer to the 7Dmk2 in terms of fine resolution – an image cropped to the same subject size as a 7Dmk2 still has 12 megapixels of resolution. The EF 100-400 L f4.5-5.6 IS ii, as a replacement for your EF 70-200 non IS and your EF 400L f5.6 – the drawbacks are lack of f2.8 aperture up to 200mm and having 100mm on the wide side instead of 70mm. Another possible drawback is that the external zoom action of the 100-400 might mean the lens can get some fine dust inside it over time if used in dusty places, compared to the internal zoom action of the 70-200mm or fixed lens. However that dust rarely shows up in images. In terms of image quality i believe the new 100-400 to match or exceed both the lenses you mention, and it has excellent IS. It also focuses pretty fast. Thanks so much Grant, appreciate your time and I now have clarity. Enjoy what’s left of the weekend. I now have to start shopping and visit my bank manager ? how would you compare to the image quality of the lenses. also how would they compare when being used with a 1.4 extender. image quality and focus performance? also thinking of up grading the camera to a 1DX mk1 . for tracking birds in the UK. Between the original EF 400 DO f4 IS lens and the new EF 100-400 IS ii, there is little to choose from at sharpness at 400mm both wide open. For sure the DO lens will allow you to shoot at lower iso settings or faster speeds at the same iso. The DO will also allow you to blur the background more effectively, and it will work better if ambient light is extremely low. The image stabilization is better on the EF 100-400 IS ii, it is much more flexible and they probably focus about as fast as one another. Of course the zoom is much more flexible and it takes up less space when walking or traveling. When a 1.4x extender is attached to both, the 400DO combination will focus noticeably faster and more accurately than the EF 100-400 combined with an extender. Of course 560mm at f5.6 is superior in low light to 560mm at f8. I would only consider the used EF 400DO IS version 1 though if it is in good condition and at a very good price, and if you think you may be able to get spares still if a component or part needs replacing. Replacing your 1D Mark 3 with a 1DX will give you more resolution if you don’t crop, as well as a much deeper buffer, autofocus that works better in low light, that is more precise, and a big leap in low light image quality. It will also drive autofocus better with a 1.4x extender than your 1D Mark 3. I have a question about filters on this lens. While going through your written review above as well as the YouTube video about this lens, you have mentioned concerns about the IQ when using UV filters. My 100-400 Mk 1 is about 7 years old. For the first 6 years, I used it with a filter, then last year, I got a scratch on the filter during a trip to a wildlife sanctuary and had to take it off. After that trip, I noticed a speck of dust in the lens close to the front element. I’m planning to upgrade to the 100-400 IS 2, I am not so much concerned about “weather” as much as I’m worried about dust. And wildlife mostly involves shooting in extremely dusty conditions. I’m wondering whether this would be a concern for the IS II version of the lens? Logically speaking, I find it unfathomable why a filter would protect the lens from dust. The point of dust entry would be the zoom mechanism, as you have mentioned in a comment above. Somewhere, a Canon USA rep is reported to have mentioned that the lens needs a UV filter to be “fully” weather sealed. Over the course of time, have you had dust issues with the 100-400 IS II lens, which could be averted with the use of a filter? Thanks also for your commitment to disseminating your knowledge among amateurs! 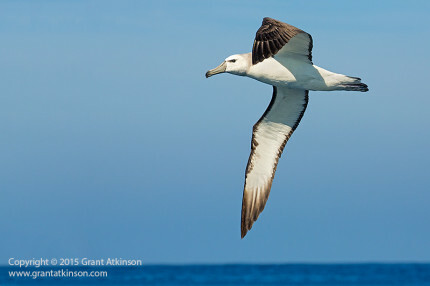 I don’t use filters myself when shooting wildlife, unless it is an ocean environment where there is salt spray around. As for dust, I would think that most dust is going to make its way into the lens via the seals on the barrel, and especially so when zooming in and out when air with dust particles in it is displaced and drawn into the lens. One of our 100-400 IS ii lenses does have some dust visible within the lens as I write this, but it is not showing up anywhere in the images, so we have not worried about it. I don’t expect that any zoom lens which has a barrel mechanism that changes length externally will be immune to picking up dust. But we take a pragmatic view of this and if it doesnt show up on the images, it is not something that hinders us. I do know that the version ii gathers less dust than the original version. We also try to keep our cameras and lenses in some neoprene bags whilst we are in the field, whereas I see many folk on game drives with their cameras and lenses uncovered. Even draping a towel over the lens whilst in dusty environments can help a little. Next time that we have a long period when we don’t need our 100-400 lenses for a while, we will get them cleaned internally, which is a fairly costly exercise here in South Africa. Zoom lenses which have internal zooming mechanisms like the EF 70-200L f2.8 IS ii and EF 200-400L f4 are less likely to pick up dust as quickly as the external zoom action designs. Some Canon bodies may also be less likely to allow dust to enter the lens than others, and in this regard I think the entry level DSLR bodies like the 760D/Rebels might be more ‘porous” when it comes to openings. We also try take note of wind direction on dusty days when photographing from vehicles, as the toughest dust conditions are usually made worse when the vehicle is traveling slowly in the same direction as the wind, and dust from ones own vehicle is continually being swirled back inside the vehicle. With regard to the front element and the ‘fully’ weather sealed comment, I believe that what Canon mean is that if you have a front element screwed firmly in place then the lens is as ‘weather-sealed’ as can be given its design and construction. If one doesnt mind the very slight impact on image quality that a good quality filter brings with it, it certainly is good piece of mind for protecting the front element. But if one is seeking the very best image quality, the least chance of flare, and the best performing autofocus results then having no filter is better. Hi Grant, I am really enjoying your videos and really appreciate the quick responses you give to your followers comments. I am about to leave for Namibia and South Africa in 2 weeks. I have a Canon 5D Mark IV and plan to bring my Canon 100-400 II lens and a 24-104 f4 lenses. I am also planning to hire a 7D mark II for the 1.6 added reach. My concern is that using the 7D mark II early in the morning on game drives might cause me to use a higher ISO with results that aren’t as good as if I used my 5D mark IV and cropped the image later. Should I stay with the 5D Mark IV and crop the image later? or do you think I will get good results with the 7D Mark II and 100-400 Mark II with high ISO in the early morning drives. What is your experience with the maximum useable ISO on the 7D mark II with the 100-400 II? Your advice would be much appreciated. Thanks. You have a couple of valid considerations that you bring up. For certain, using any crop sensor camera like the 7D Mark 2 on the EF 100-400 f5.6 lens will mean that there is a high chance of being forced to shoot at high iso settings to capture wildlife activity that may be happening in low ambient light. It is routine for Helena and I to go up to iso 6400 when we are using our own 5D Mark 4 bodies combined with the EF 100-400 f5.6 at such times. In those instances we far prefer the full frame sensor of the 5D Mark 4. However, if you are far away from your subjects and you have to crop away more than half your frame anyway, then the image quality advantage of the full-frame sensor of the 5D Mark 4 is diminished. But, if you are finding most of your subject matter and images when the light is already quite bright and shooting at iso 400 to 800 range then the difference in image quality between the 5D Mark 4 and 7D Mark 2 is less noticeable. Field of view crops and cameras with smaller and larger sensors generate continued confusion amongst users, and photographers, specially online when many opinions are available. We know that cropping any image from our 5D Mark 4 from its native 30 megapixel resolution all the way to around 13 megabpixels will result in an image identical in framing to that from the 7D Mark 2 at 20 megapixels. I have tried to touch on some of these differences in the comparison article of the 5D Mark 4 to the other mid range Canon bodies in another place on this website. Feel free to ask any questions here if you wish and I will do my best to provide specific answers. Hi Larry, I have a similar situation – in fact I have the same kit as you :). I sold my 7D2 and got the 5D4 because I found myself struggling a lot with low light on the 7D2. I’m sure the problem is with my technique – someone with steadier hands or a monopod technique would Lee the iso down and get good shots at lower shutter speeds. I came across this article (http://arihazeghiphotography.com/blog/undrestanding-crop-factor/) and the math says that the 7D2 has 1.3 more reach due to the Pixel Density, and not 1.6 as is commonly thought. Basically the question is how many pixels you get on the subject. As I’m also planning a trip to Kruger I was curious whether your motivation is extra reach, or having focal length flexibility. For reach I’ve been thinking about the 1.4x TCIII which seems to be a excellent companion to the 100-400II as per reviews. For flexibility of focal lengths, I was eyeing the 6D2 to pair with my 24-105 but could not get over the fact that that camera has all it’s AF points closer to the Center. Some folks have recommended the 77D or the 80D as a good companion for the 5D4 because both of these have 24MP sensors – bigger than the 20MP on the 7D2. 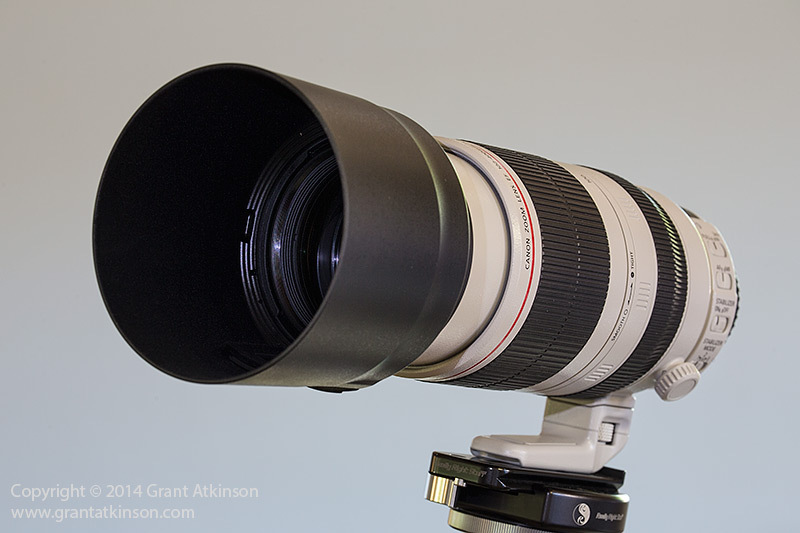 I have ordered a Canon 100-400mm f/4.5-5.6L IS II USM to use on my 7D Mark II. And now I want a teleconverter too. I want to ask you how many AF Points can we use on 7D Mark II + EF 100-400mm f/4.5-5.6L IS II USM + Extender EF 1.4x III ?? I have tried an Extender EF 2x II on 70-200 f4 it was only one AF point on center. As I see on your video you can use 27 AF Points on 80D. Thanks for writing. For viewfinder autofocus, you will only have the centre focus point available on the 7D Mark 2 when combined with the EF 100-400 IS ii and EF 1.4xii Extender. You can use Single Point AF and you can also use the AF Expansion mode with one AF Point surrounded by 4 helper points, but that is still locked into centre location. In Live View, with the 7D Mark 2 and EF 100-400 IS ii and EF 1.4x iii Extender combination, focus points can be selected over the entire frame. It works the same in Live View as without the extender attached. The 80D is a less expensive model than the 7D Mark 2 but it has some newer specifications to its focus system which allows for the expanded AF point coverage when used with lens and extender combinations. Grant – You are my Go-to Canon Guru. Not only do you go into great, useful detail in all your posts and reviews, but your experience with the equipment you shoot with is hugely appreciated, and goes a long way in positioning you as a credible and knowledgeable advisor in all things Canon. Thanks for your help today… and for your generosity of spirit in helping us get the most of our gear!! Loving my Canon 7Dii, now paired with the 100-400mm 1:4.5-5.6L II USM lens, both on your recommendations. FABULOUS combination!! I have 5d mk IV and 80D. Looking for multipurpose telephoto lens. either 70-200 f2.8 OR 100-400 IS II. please suggest which one should I pick. I want to capture portrait as well want to use for wild life in my travel. The two lenses, 70-200 and 100-400 are both excellent in their fields, however, most of the time the 70-200mm can be too short a focal length for wildlife (in most places i go to). On the other hand, the EF 100-400 IS ii can do portraiture at 100mm but it cannot offer the same degree of background blur, as the 70-200 f2.8. Perhaps your choice might depend upon whether wildlife or portrait photography is the most important. If you really want to keep the background blur capability of the 70-200 f2.8 you can always buy it and use it with a 2x or 1.4x extender for wildlife. 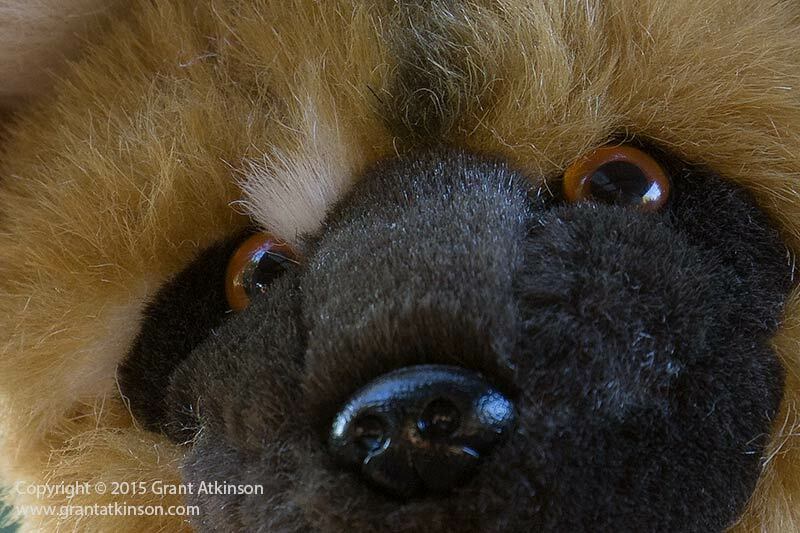 The 70-200 with extender is not as good as the 100-400 without extender but it is still a reasonable option.